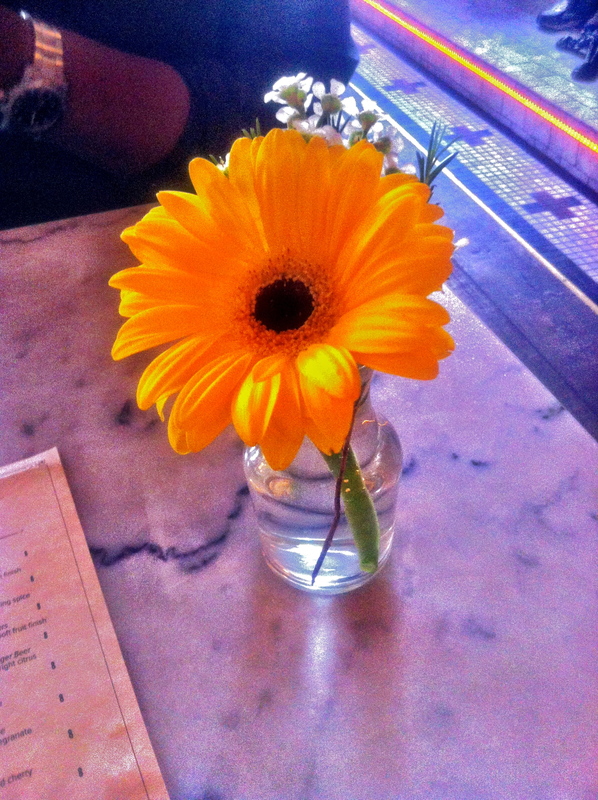 So Brooklyn Girl has brunch, which I had no idea existed or else I would have gone sooner. Came here on Saturday around 11 am and was happy to see that there were plenty of free tables, which is nice considering trying to come around dinner time without a reservation has not worked well for us recently! 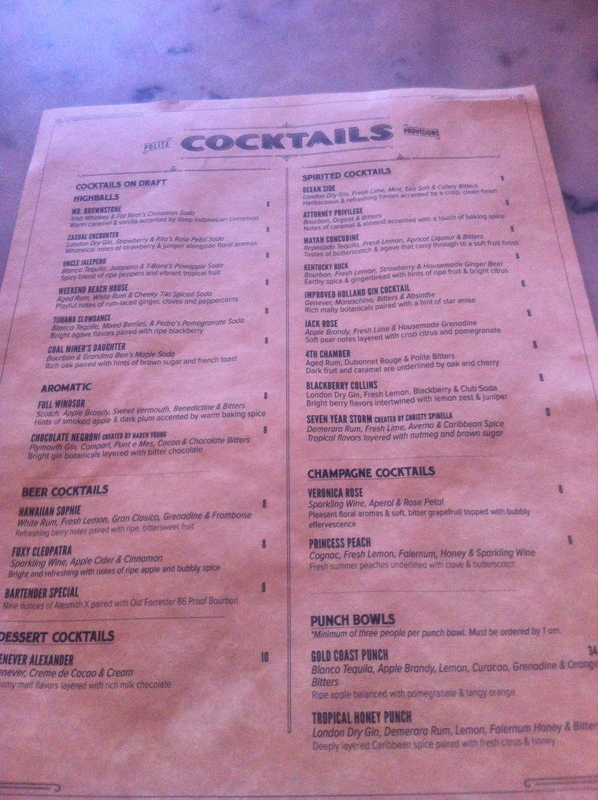 DRINKS:First of all, let me say right off the bat that Brooklyn Girl has the BEST Bloody Mary I’ve ever had. And this sentiment was echoed by others at our table. It’s so flavorful and has the perfect amount of spice. 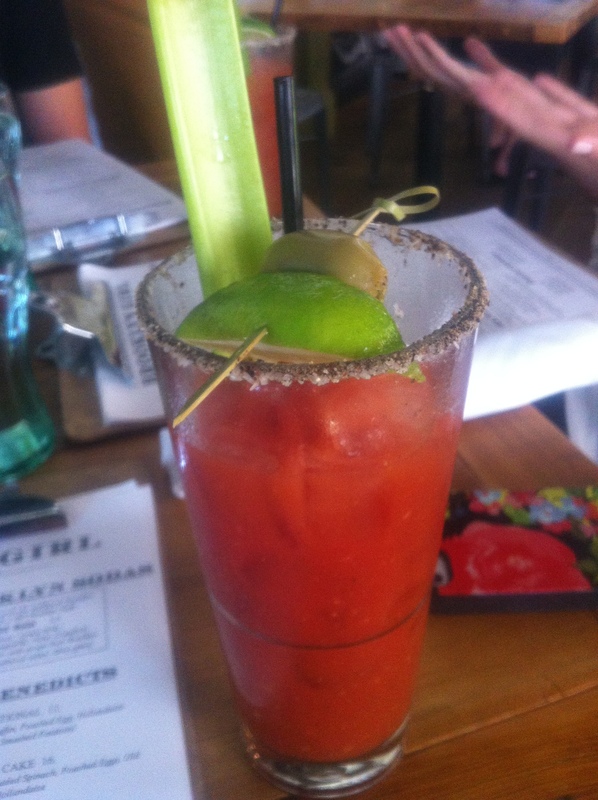 Watery Bloody Marys might very well be one of the worst things ever. I blame these bland and watered down specimens for me believing I hated Bloody Marys for most of the 24 years I’ve been on this Earth (I have seen the light and converted about 3 months ago). They have a special Bloody with bacon and a pickled quail egg too but we all went with the House Bloody which is described as “No Frills, All Delicious, Svedka Vodka, House Bloody Mix Celery, Jalapeno stuffed Olive, Lime, S&P rim”. Spot on. 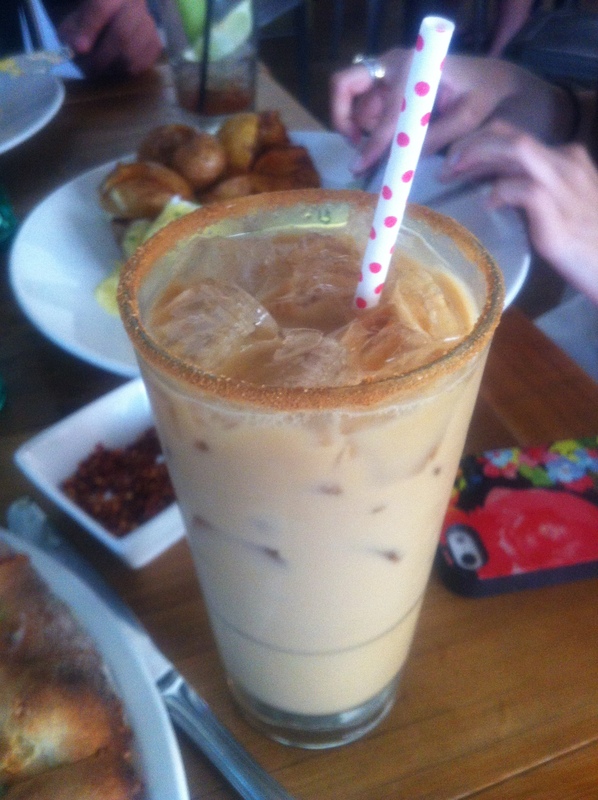 We also loved their Horchata Borracha, or drunk horchata if you habla español. Housemade horchata + Kraken rum = deliciousness. This also came with a cinnamon sugar rim that was a nice touch. ENTREES: As far as brunch options go they have omelettes, benedicts, pancakes, french toast, granola, and some less usual fare like their burger (add an egg to it! ), a T.A.B.L.T. 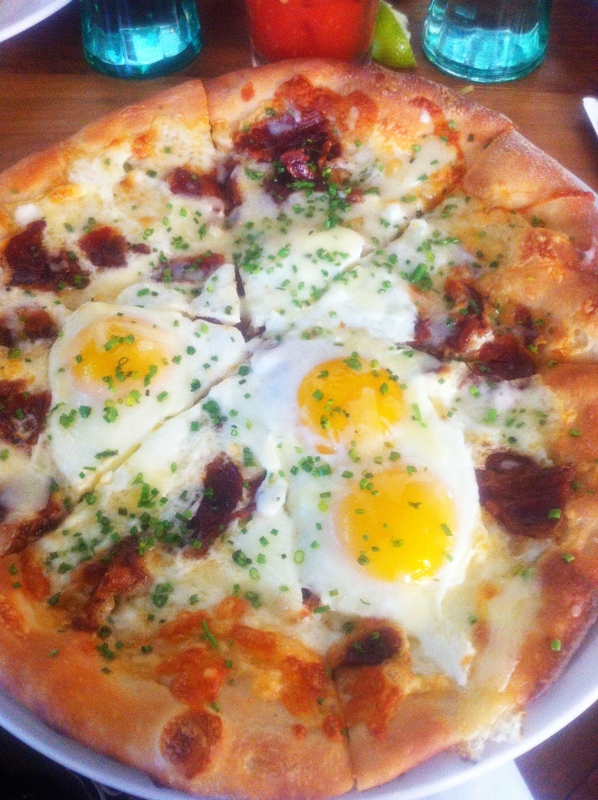 (Turkey Avocado Bacon Lettuce Tomato), a duck confit + duck egg dish, chicken and dumplings, and a breakfast pizza! It’s definitely an interesting but tasty selection. I went for the Breakfast Pizza which did not disappoint at all. It comes with thick cut bacon, aged white cheddar, eggs, and chives. No tomato sauce on this pizza, and it was better this way. 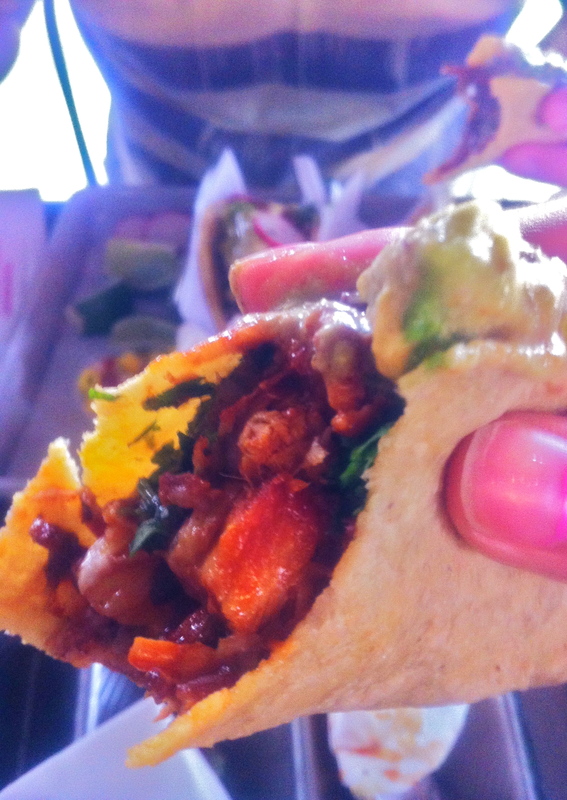 It’s super savory and there’s enough bacon that you get some on each bite. 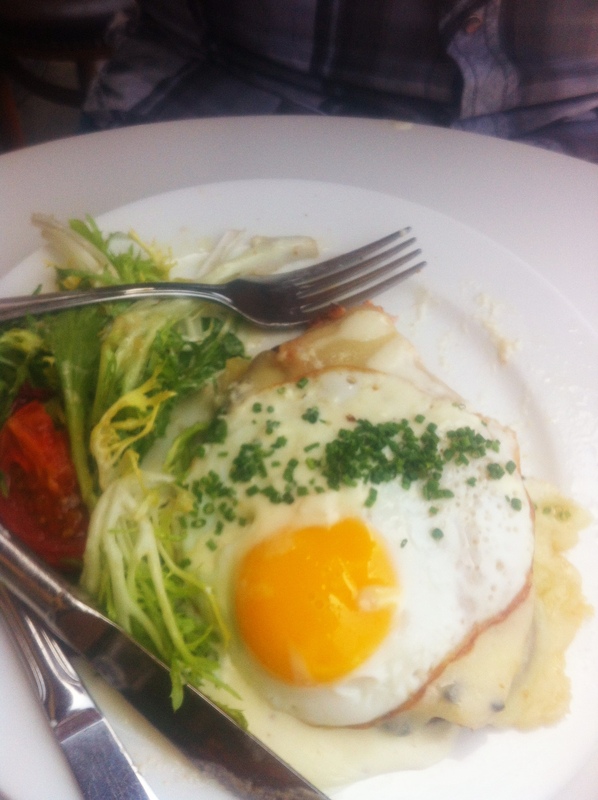 That with perfectly cooked eggs with soft yolks that are perfect for dipping in was heavenly. Wish the pizza had more char on it but besides that it was just about perfect. And huge too! Definitely more than enough for splitting. 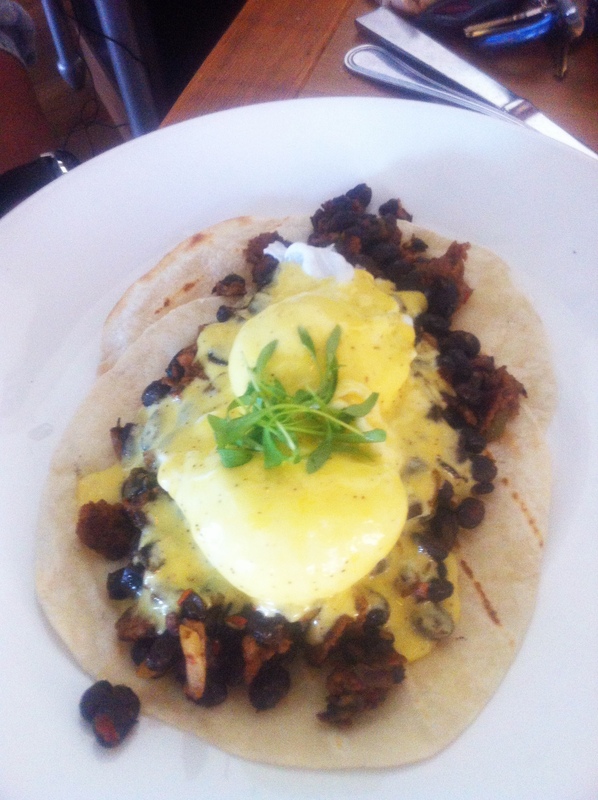 Some of the other dishes we ordered were the South of the Border, a Mexican inspired benedict. This came with house chorizo, poblano peppers, black beans, red onions, flour tortillas instead of a biscuit, poached eggs, and an ancho hollandaise. 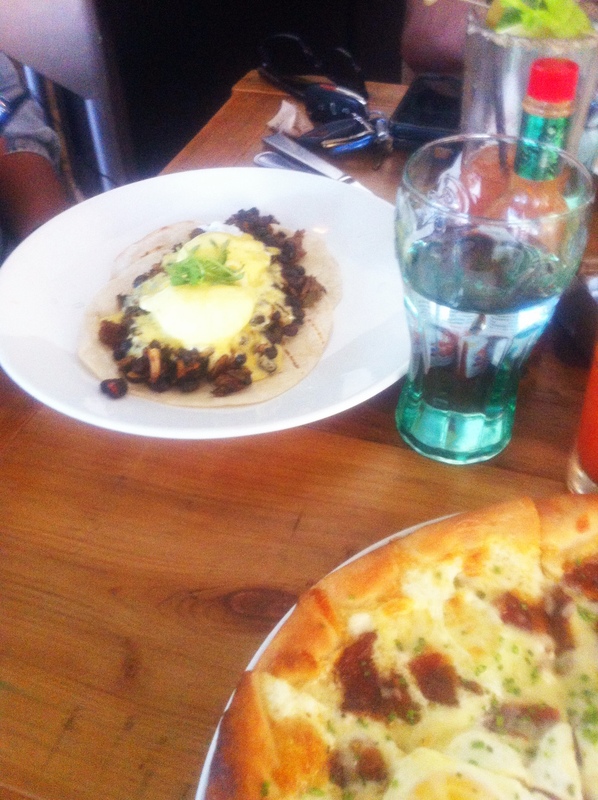 I’m not a huge black bean person but besides that everything was pretty tasty. The chorizo was flavorful and the eggs were perfectly cooked. 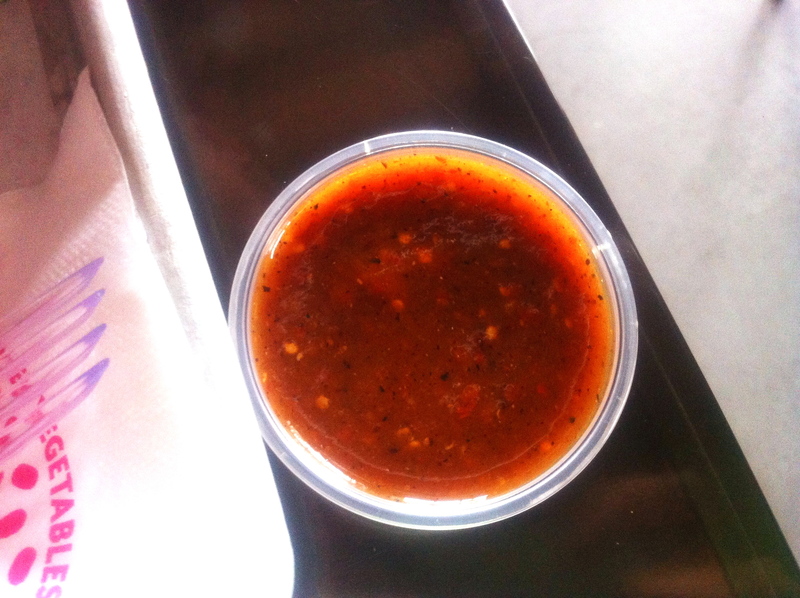 We asked for some hot sauce for this dish and with that it was good to go. 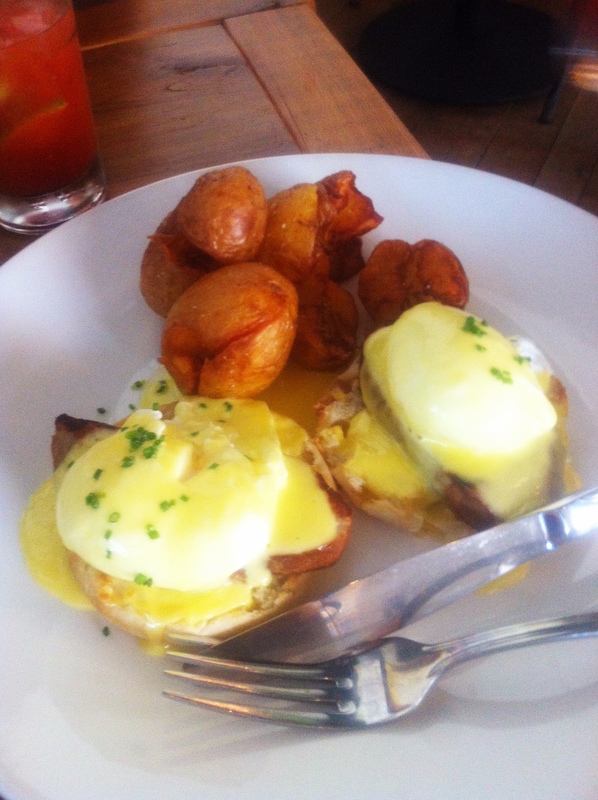 We also got their Traditional Benedict. This was smoked ham, english muffin, poached egg, and hollandaise with potatoes on the side. Despite this being pretty standard fare I liked it even more than the South of the Border because all the components were individually so good. The potatoes were super crispy and I don’t normally like thick cut ham but this one tasted so much more like real pork than the usual salty processed stuff that I could eat it by itself. Overall, Brooklyn Girl continues to impress me both with their creativity and with the top-notch quality of their ingredients. 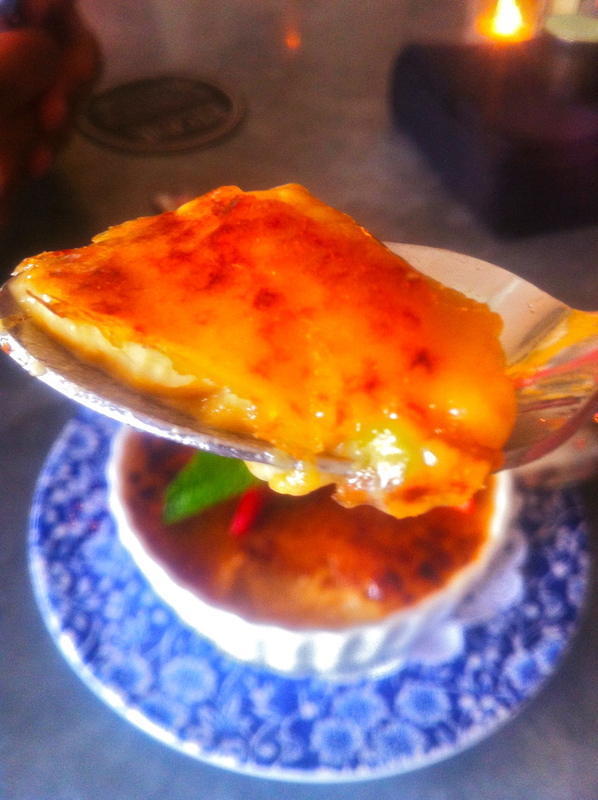 They also do a good mix of having traditional options and bolder dishes for the more adventurous. I would definitely highly recommend brunch, especially before everyone else catches on and it becomes as busy as their dinner services! 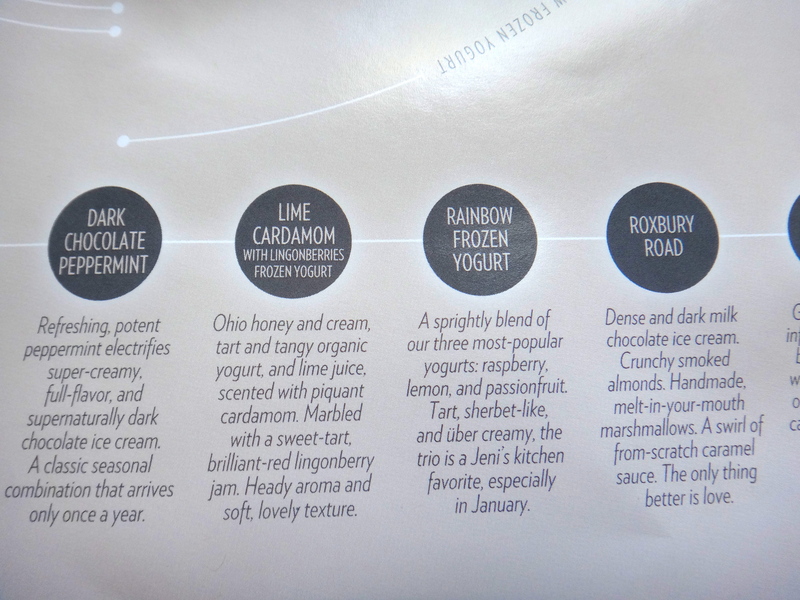 I had heard about Jeni’s before, and some of the flavors (namely the Banana Cajeta) sounded incredible. 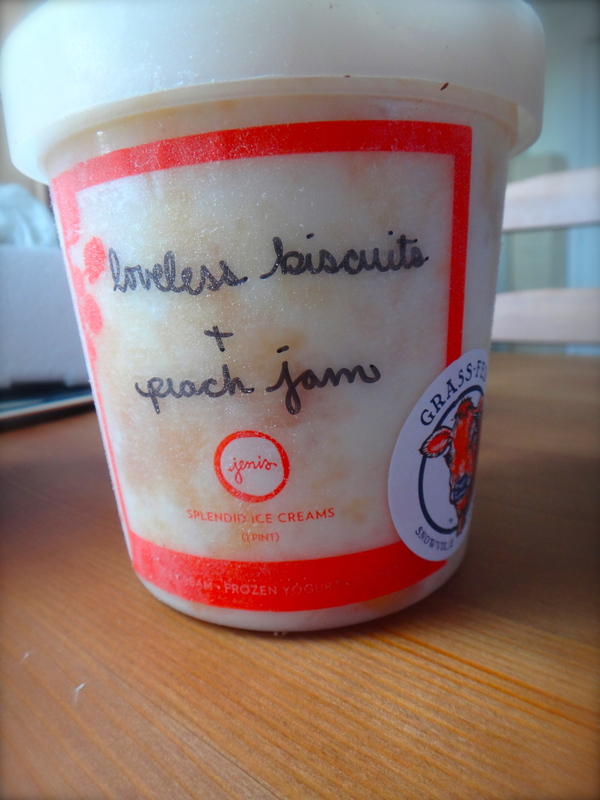 The flavors I won aren’t part of the normal Jeni’s flavors but were the Zelda Collection inspired by Zelda Fitzgerald (read more about it on Jeni’s Blog). I believe these are now sold out but the quality of the ingredients was amazing, I will definitely be buying this again. In SD I hear they are available at the La Jolla Bristol Farms. The four flavors I got were: Blackberry + Sweet Cream, Cognac + Marmalade, Loveless Biscuits + Peach Jam, and Dark Chocolate Rye. Doesn’t it already sound amazing? So the first one I tried was the Blackberry + Sweet Cream. When looking at the flavors this was actually the one I was least excited about since blackberries and cream is a fairly normal ice cream flavor. Not like this though. This was actually my favorite. You can taste how sweet and extra milky tasting the cream is, I think grass-fed cream has an extra sweetness and flavor that regular cream does not have. 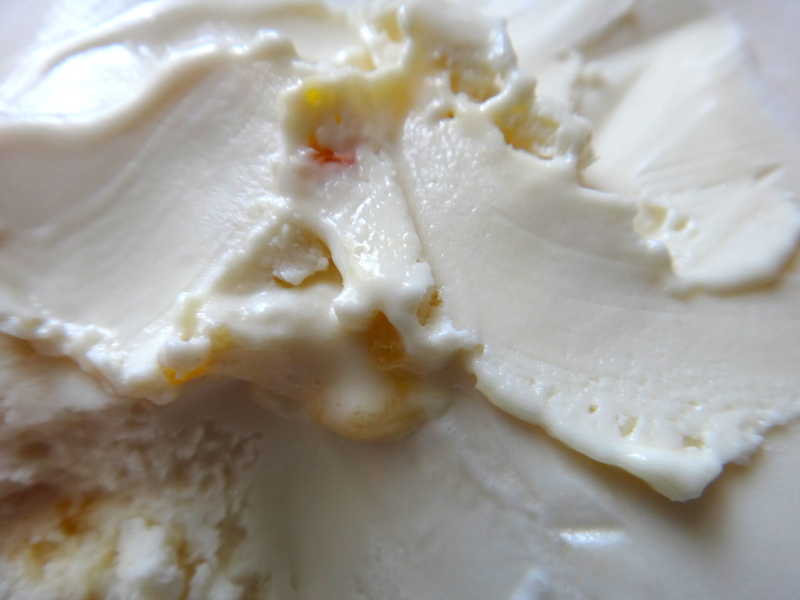 If you’ve had bacio di latte flavored gelato this is similar to how the cream tasted, not like a neutral backdrop for some other ingredient but the star of its own show. 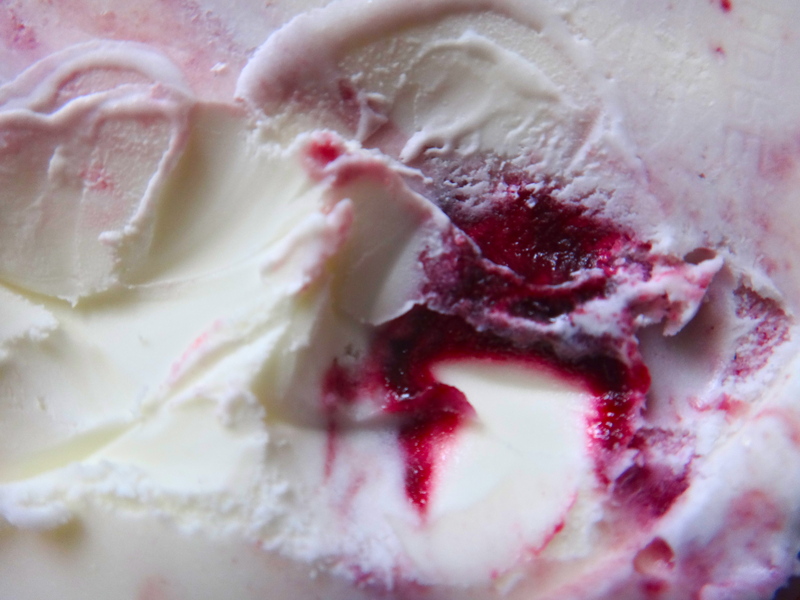 And the blackberry swirl. 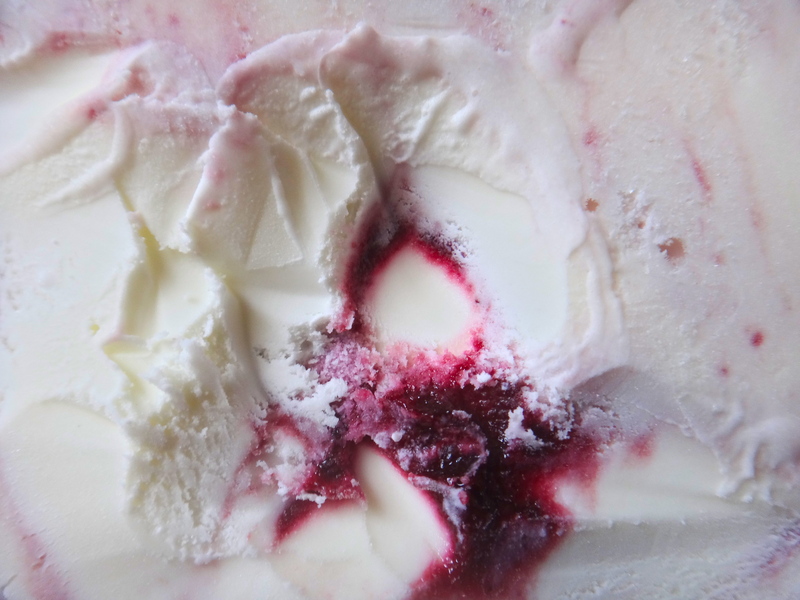 I’m actually not someone who loves fruit ice creams because a lot of them can be overly sweet (like they’re trying to kill the fruit taste with sugar) and artificial tasting but this tasted so fresh, like the darkest, juiciest blackberries that had barely been sprinkled with sugar. Together this was amazing and I find myself just randomly sneaking into my freezer and digging after the little rivulets of blackberry. It’s that good. 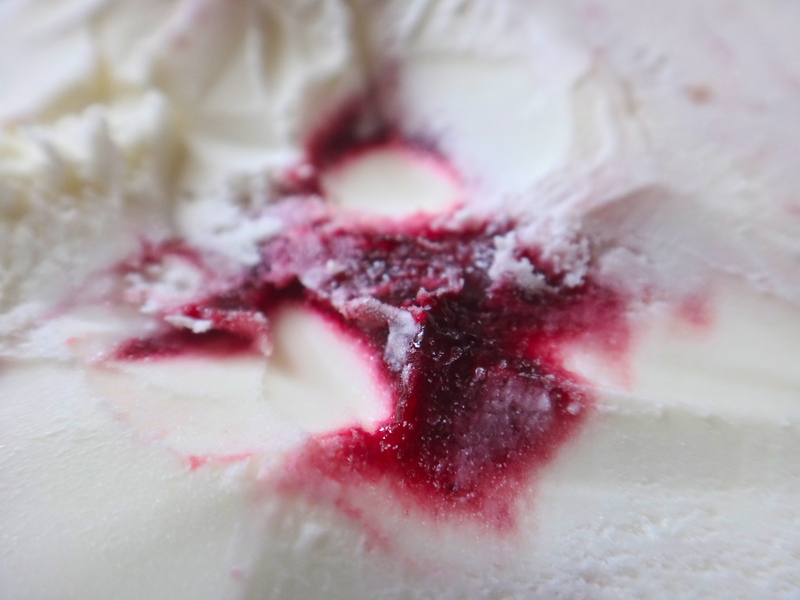 The flavor was inspired by a thank you note Zelda Fitzgerald gave to a friend that told her she would see “That your eyes are bathed with blackberry juice, which you know will make it so you never want to sleep, and that all your shaving suds turn into whipped cream”. Makes your regular emoticon-ridden thank you texts seem quite pedestrian no? 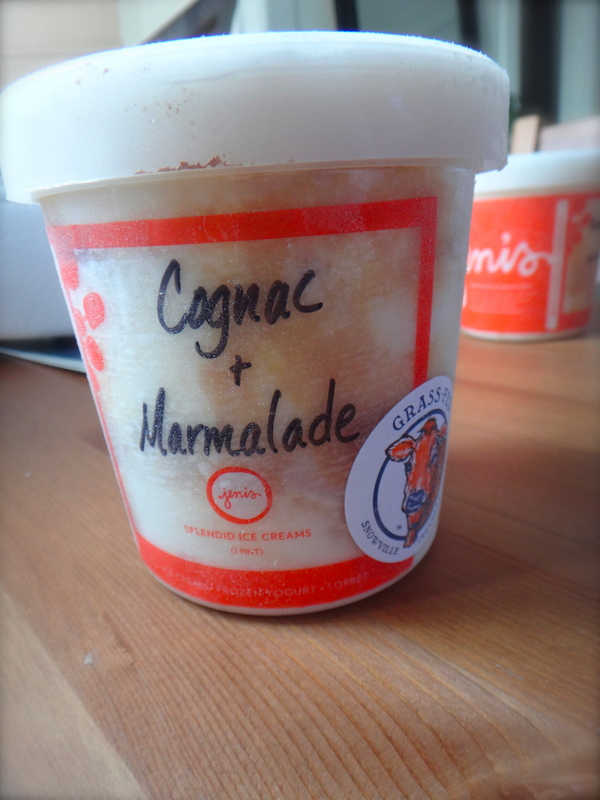 The next flavor I tried was the Cognac + Marmalade. I love cognac. With alcohol I’ve always had the taste of an old British man, I’m pretty sure at 19 my favorite alcohol was gin (and I lived in Canada where the legal age is 19 so this is a perfectly legal anecdote). 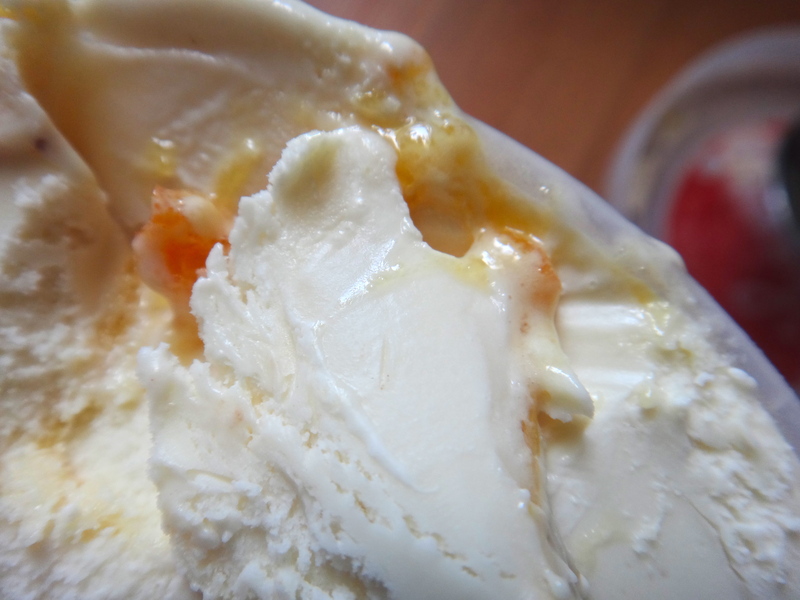 The Armagnac cognac here just perfumes the entire ice cream so that it has the slightest oakiness and vanilla notes. It almost tastes as if there’s stil some of the bite of the alcohol but I think that was mostly the bitterness from the Seville Orange marmalade. 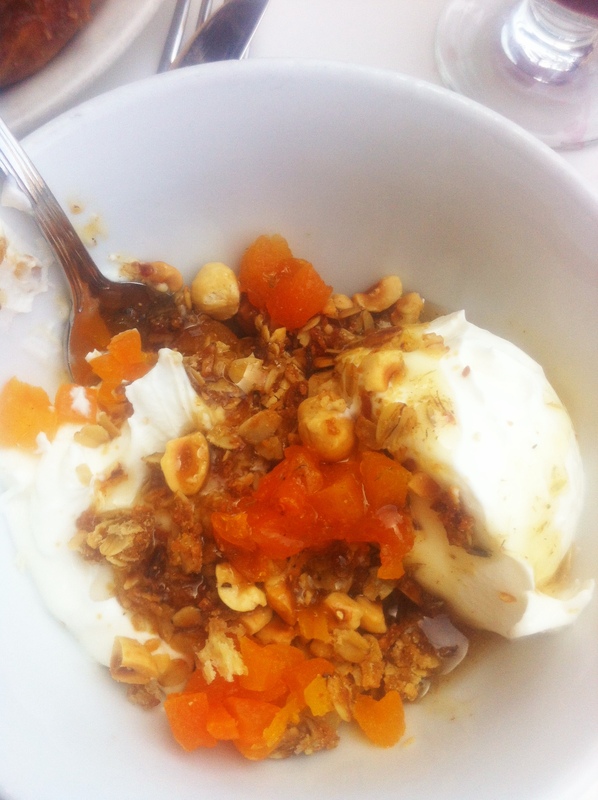 Confession: I actually don’t love marmalade. I love oranges and I like orange zest but I find marmalade often to be too bitter to eat alone. 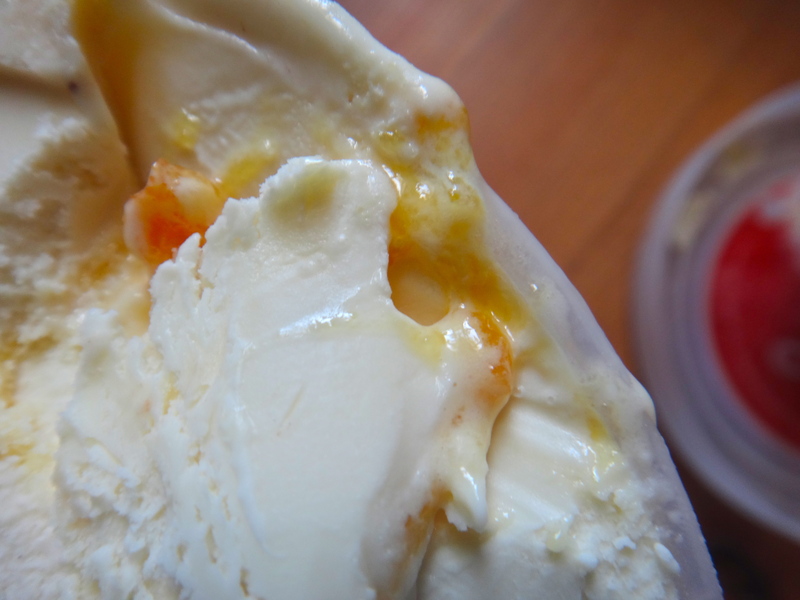 I think if you like marmalade you will LOVE this ice cream. 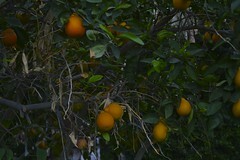 The marmalade is orange-y and jammy and flowery and has the softest flecks of bright orange zest. I’m considering sending to my mom because she loves marmalade anything and she would adore this. The cognac accents the marmalade so well and obviously the sugar and cream balance out the bitter notes. This would be amazing with dark chocolate fudge. 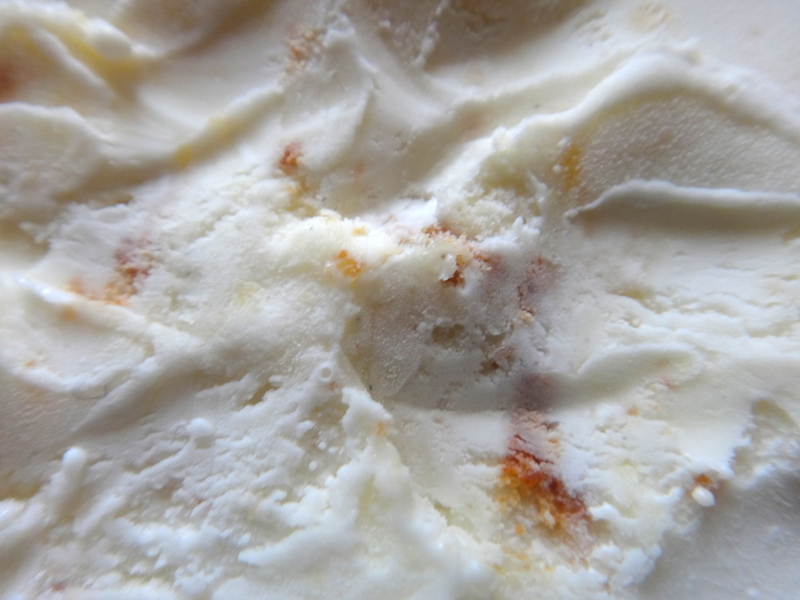 This flavor was inspired by Zelda’s love of Sidecars. 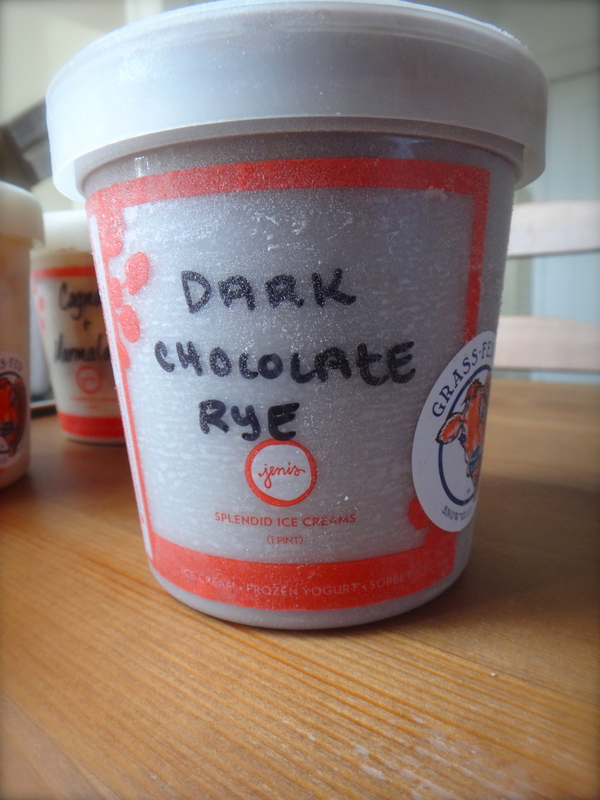 After this I tried a flavor I was pretty intrigued by, the Dark Chocolate Rye. I love rye whiskey and I love dark chocolate and naturally two good things make a better thing. Has anyone seen that episode of Friend’s where Rachel makes a trifle and then accidentally adds peas and meat to it or something? And then everyone hates it except for Joey who goes “What’s not to like? Chocolate? Good. Cream? GOOD. Meat? GOOOOD!”. Haha. That’s my logic anyways. Although this was lovely I think it was not one of my favorites. Don’t get me wrong this is some of the best chocolate ice cream I’ve ever had but I was hoping there would be dark chocolate chunks or something. Then again I’m quite partial to ice cream with stuff in it, I’m the kid that buys Ben & Jerry’s then burrows through the ice cream eating all the cookie dough/brownie/whatever through the ice cream and leaves the de-gutted remains in the freezer for someone else. 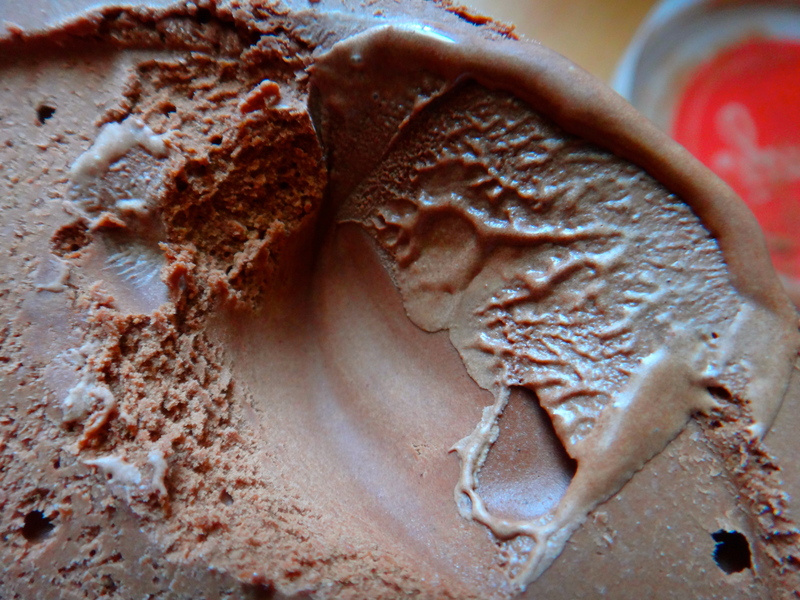 This is their chocolate ice cream with Middle West Spirit’s OYO White Rye Whiskey and carraway. The rye flavor is quite subtle and you notice it as a slight lingering taste after the creamy bitter dark chocolate fades. 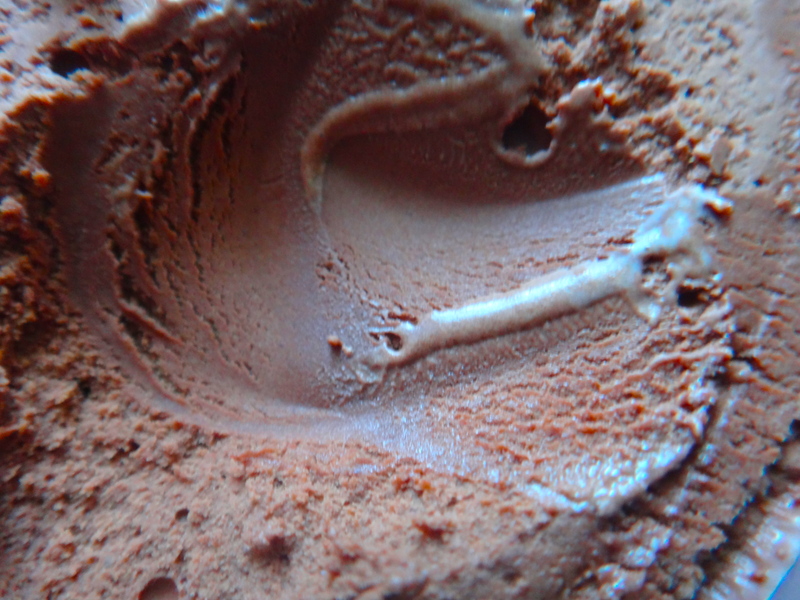 If chocolate ice cream is your favorite this is leaps and bounds better than the crappy “chocolate-essence” tasting stuff you can get at grocery stores. Its dense and rich and almost chewy. Although this is not the flavor I will randomly sneak bites of all day this would make an amazing chocolate sundae. With maybe some dark chocolate fudge, smoked almonds and sea salt? I will let you know how that goes. 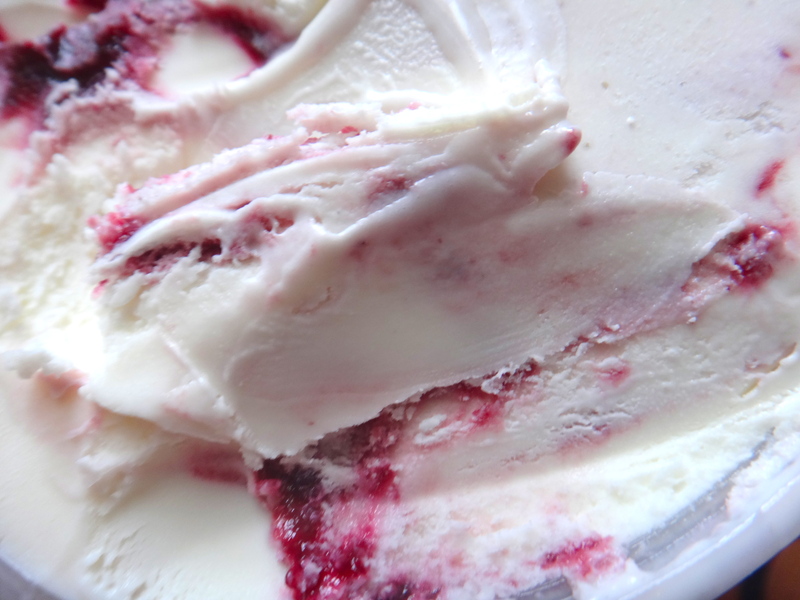 This flavor was inspired by when in 1921 the Fitzgeralds were living in their hometown of St. Paul, Minnesota where “. . . rye flowed as though it were an elixir” at the “weekly hops at the club.” And carraway because…I don’t think I have to explain that one right? Ok. So lastly I tried the flavor I was most excited for. The Loveless Biscuits + Peach Jam. In general I think ice creams are great with cake or cookies so to have a carb directly incorporated into the ice cream is nothing sort of efficient. When I first opened this I was sad to see that I didn’t initially see large chunks of biscuits. However as soon as I had my first bite I knew large chunks of biscuits were not necessary (although they were there too, just a little further down). 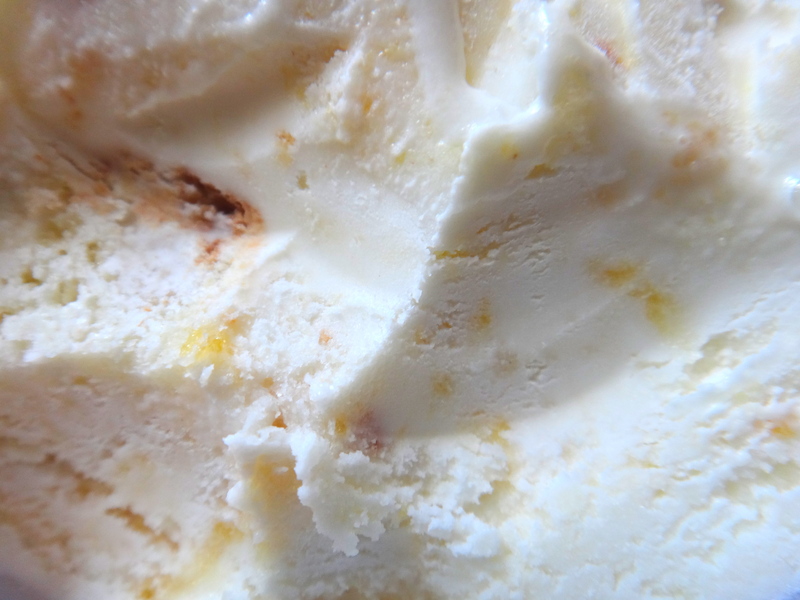 The ice cream itself just tasted of biscuits. 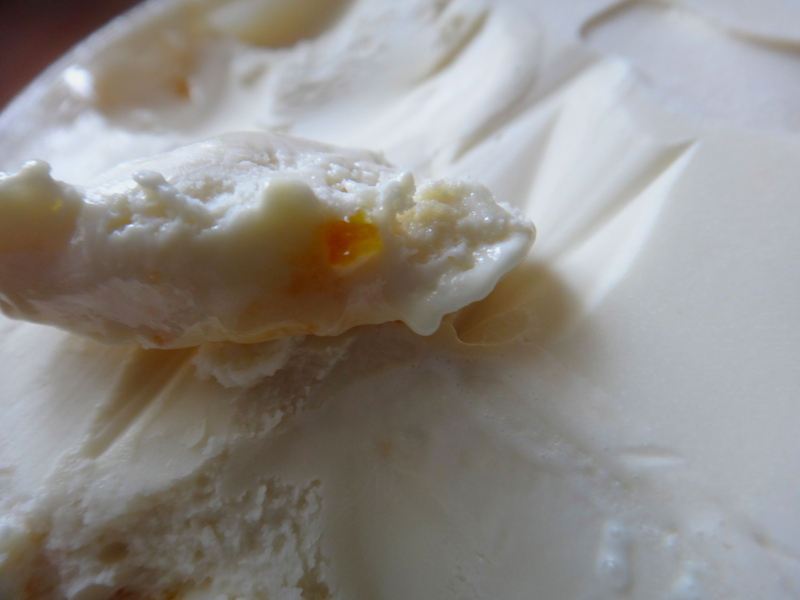 Not that it was grainy at all, just like cream infused with slightly sweet, buttery biscuits. 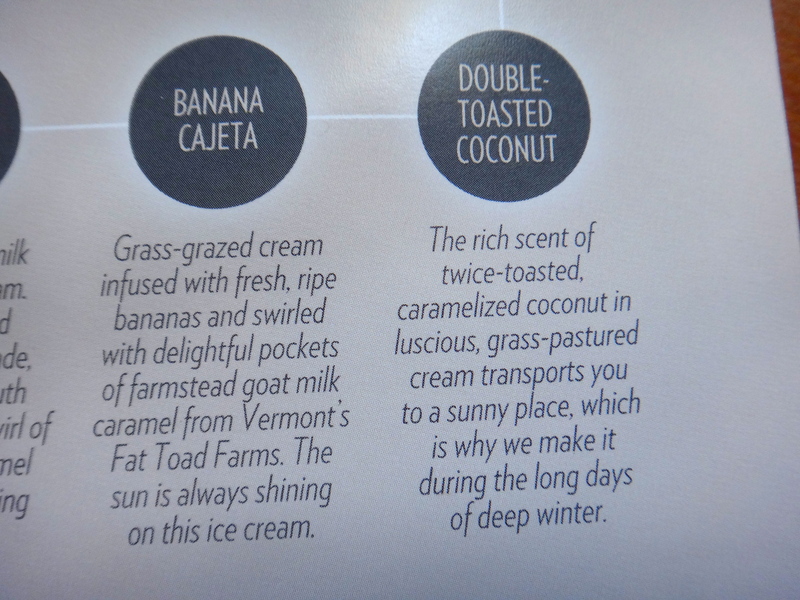 If you’ve ever had Momofuku’s cereal milk ice cream this is reminiscent of that. 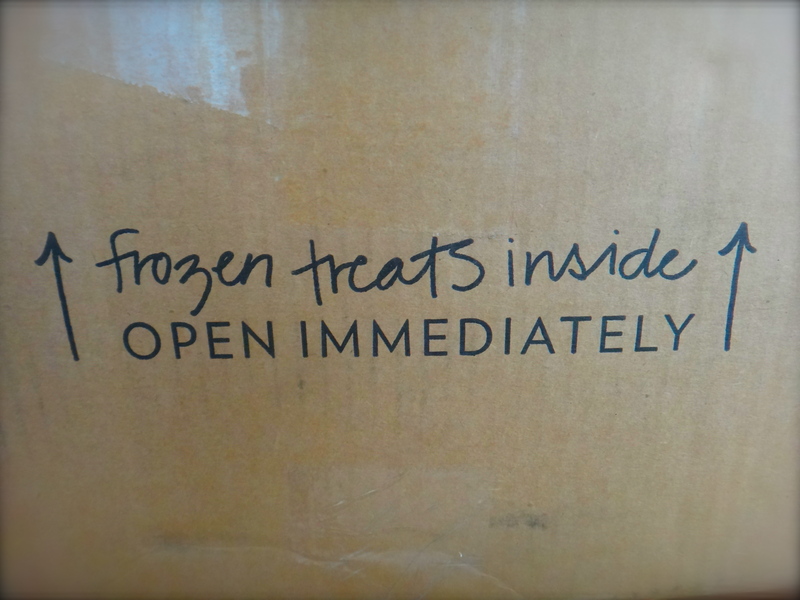 This is the other ice cream I keep sneaking bites of. The peach jam is also amazing, jammy ripe peaches that bring sweetness to the bready biscuits. 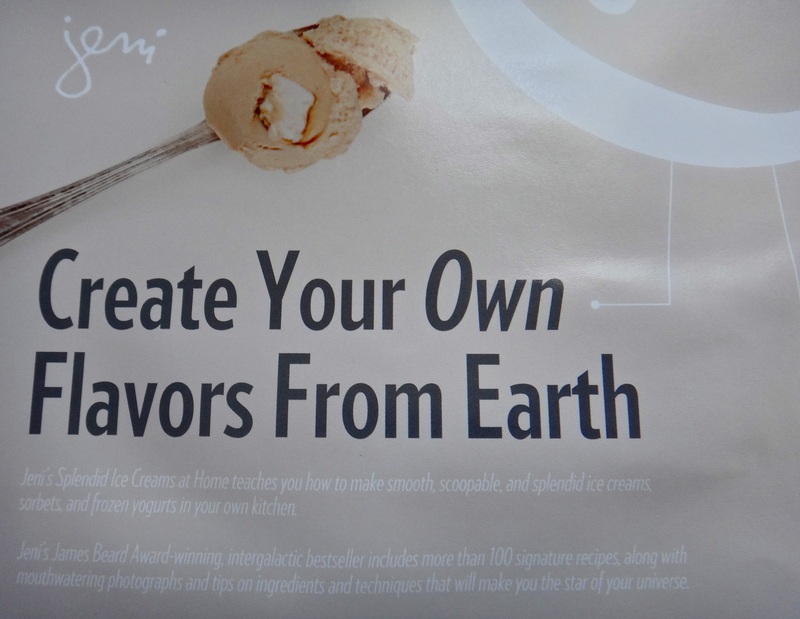 This ice cream does not need any sauce or topping to be eaten. Even a crumble on top would be overkill. At most if you twisted my arm I would put some barely sweetened whipped cream over top of it. This was inspired by Zelda Fitzgerald’s favorite food: southern biscuits and peach jam. Jeni was also inspired by the Loveless Cafe in Nashville. Overall this stuff was unreal. 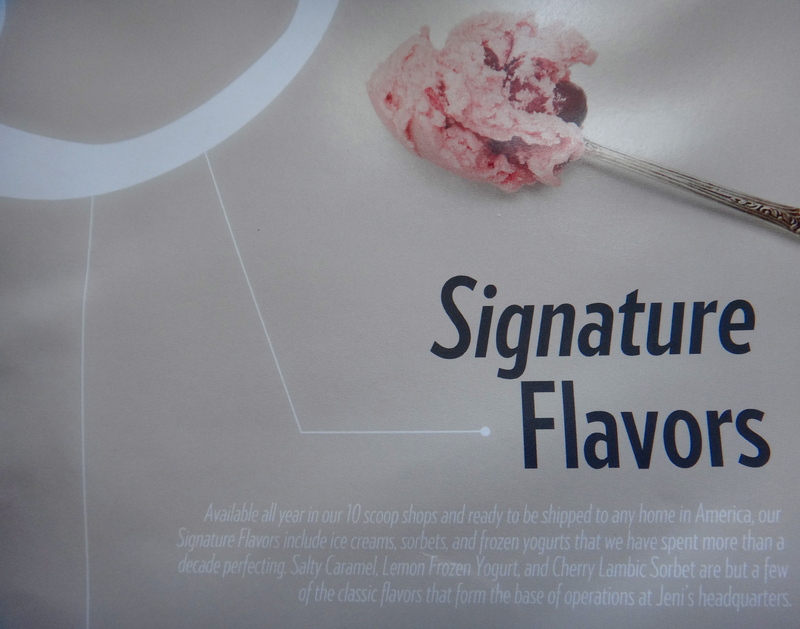 The flavors are just incredibly creative, interesting but still so tasty and made with just the best quality ingredients. 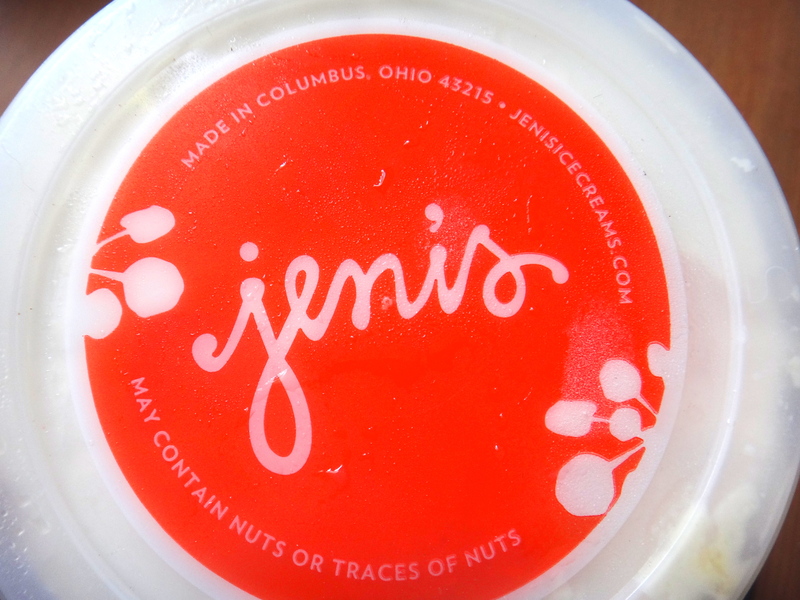 Jeni’s is based in Columbus, Ohio so even though I sadly cannot go to their store I will definitely try to find some of her other flavors here! You can apparently make your own flavors too. 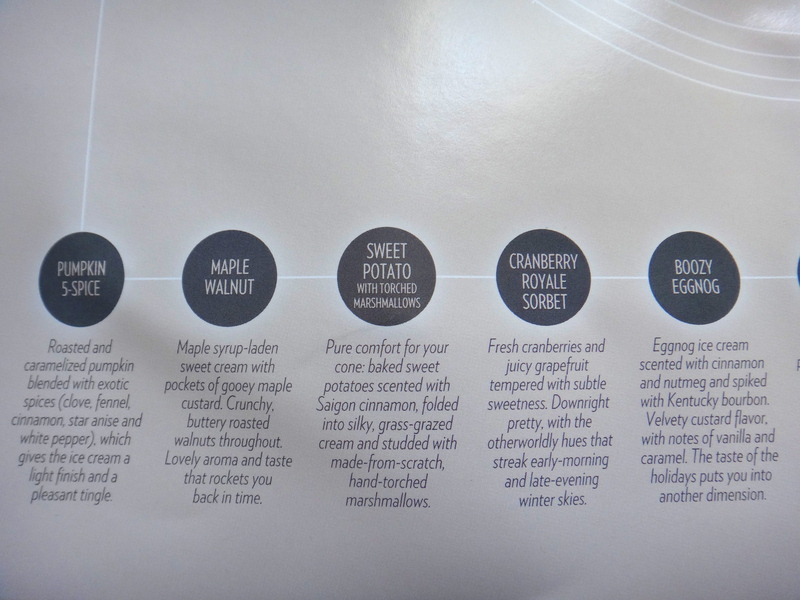 And here are her other signature flavors. 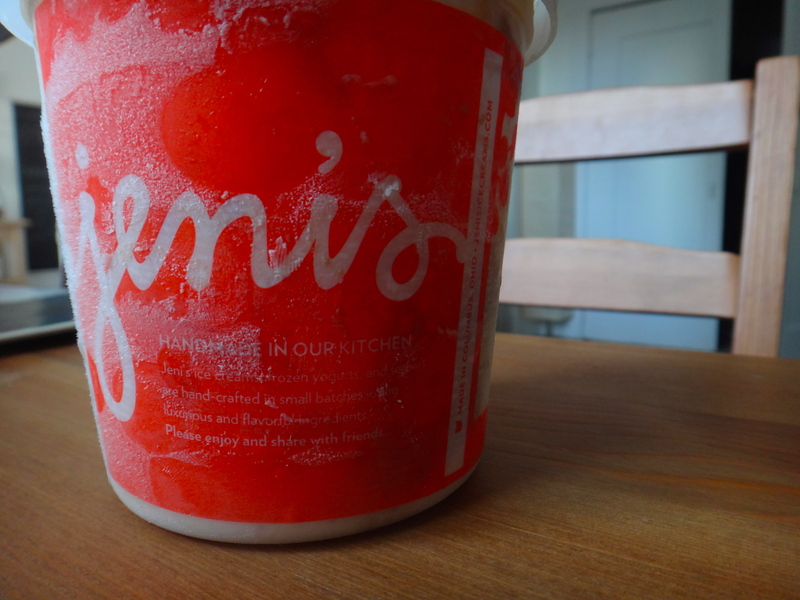 Thank you Jeni’s and Serious Eats! Oh and btw the cocktail I said would work well as an ice cream was a Scottish Breakfast: scotch, maple syrup, orange zest, cinnamon and cream. So the first time we went to Jayne’s we loved their patio and thought the food was good but perhaps a tad pricey (see our previous post here). 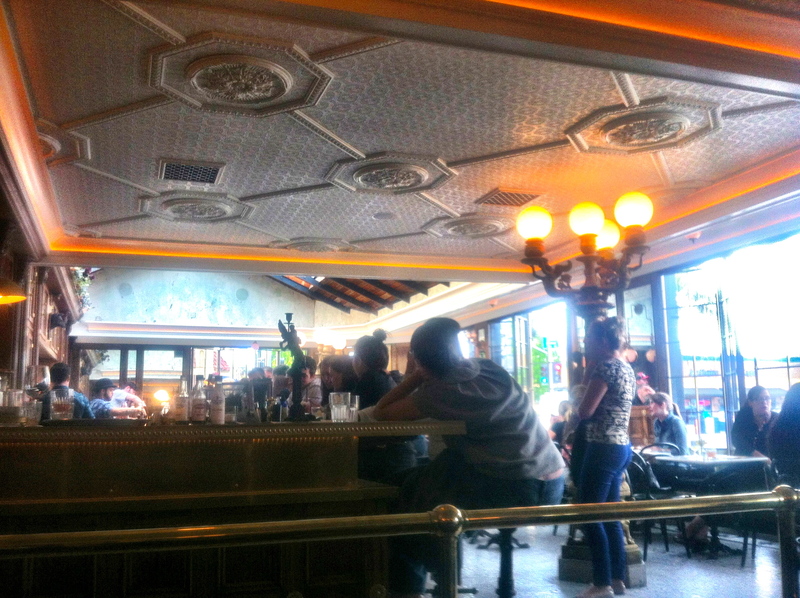 But we loved the decor and vibe of the place so we returned for the most cost-efficient of hours, happy hour! For happy hour Jayne’s has $6 dollar drinks, wine, and small plates, as well as $5 dollar beer and $3 dollars off regular cocktails! We ordered a couple of the small plates, drinks and dessert and were quite pleased with the food, the drinks and the price. 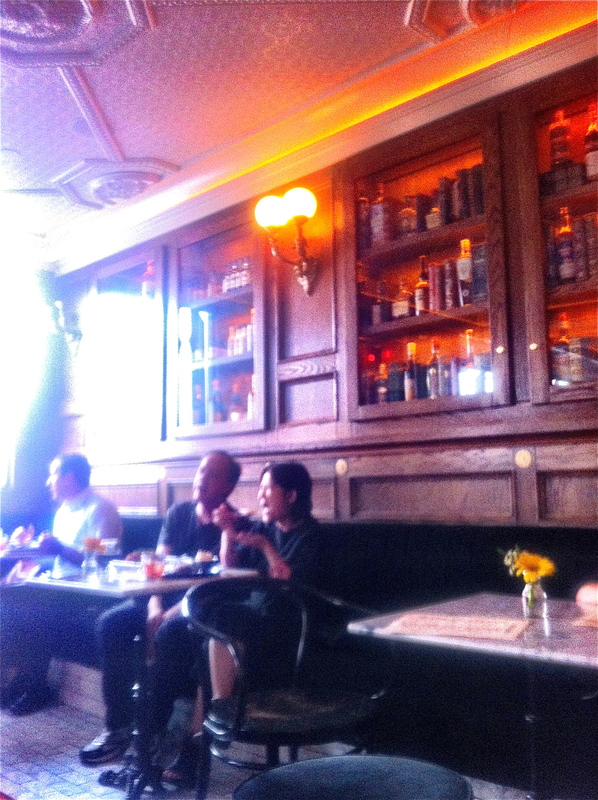 What was great too was that there was plenty of seating at the bar and bar tables during happy hour and unlike a lot of bar areas this one had plenty of natural light and it was a great spot to hang out with friends. 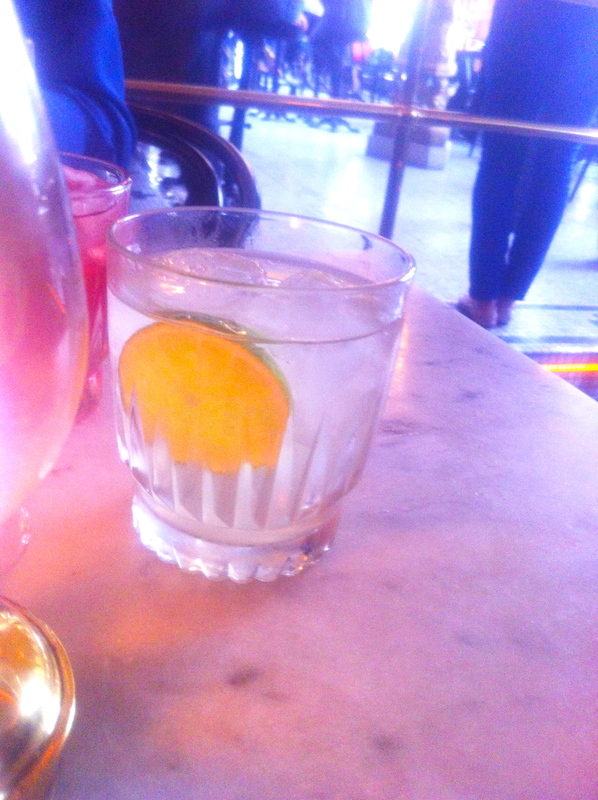 DRINKS: We ordered a Gimlet and the Tom Collins. 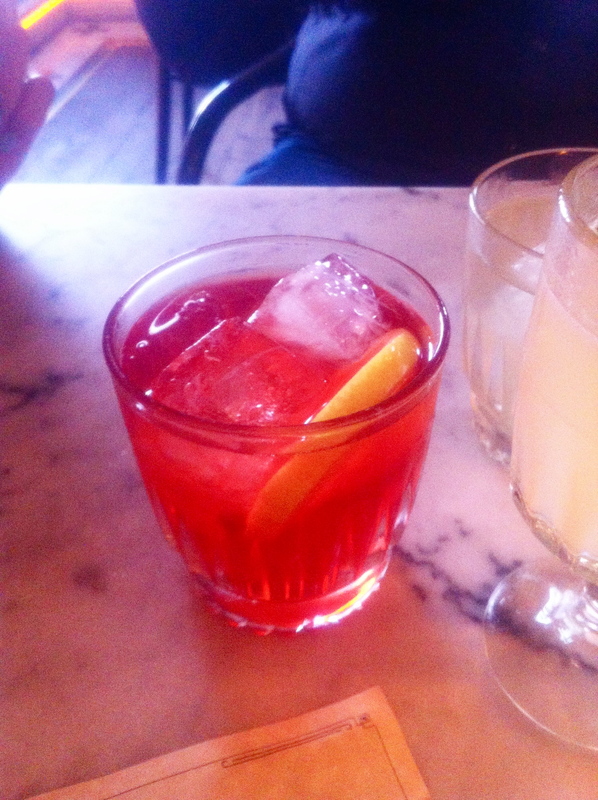 Both were part of the $6 dollar specials, which also include the Rickey, Highball, Daiquiri and the Old Fashioned . 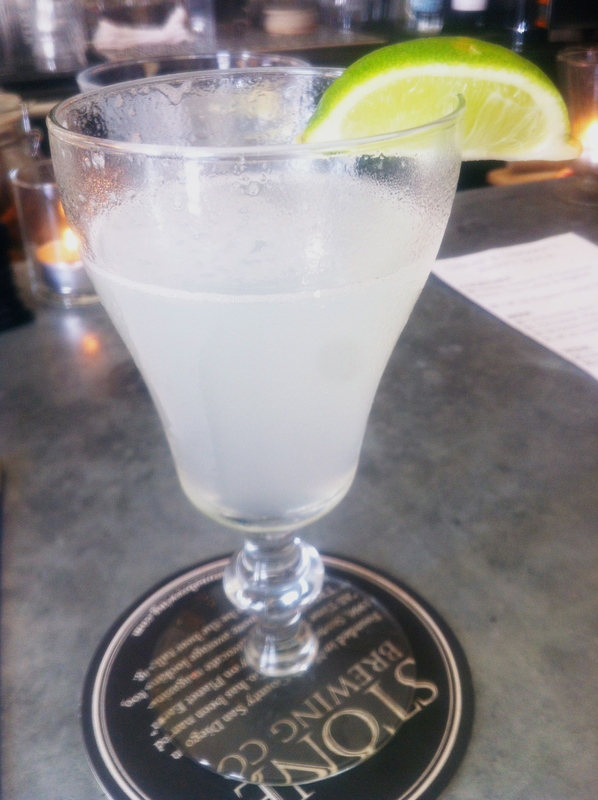 The gimlet is basically gin, lime juice and some sugar so if you are a fan of tart/sour (I am) this is a simple refreshing drink. 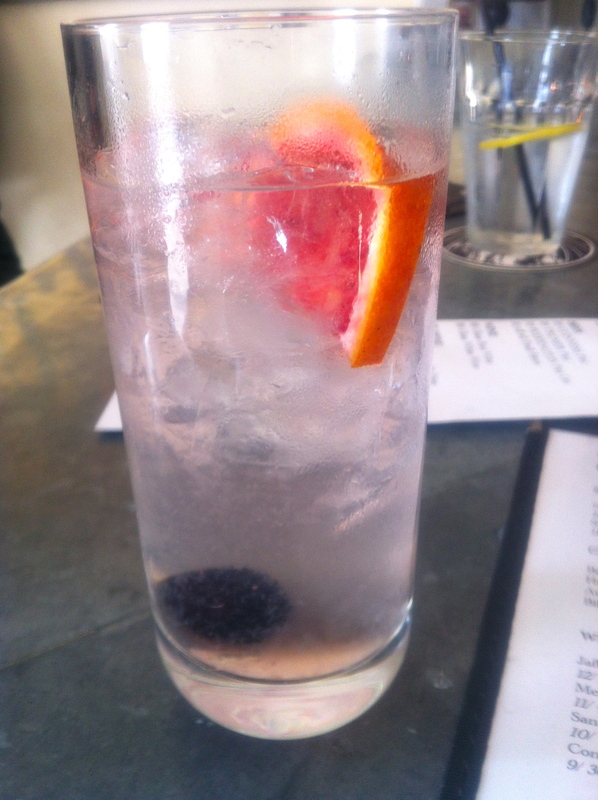 The Tom Collins is also gin-based, with lemon, sugar, club soda and a cherry and orange garnish. 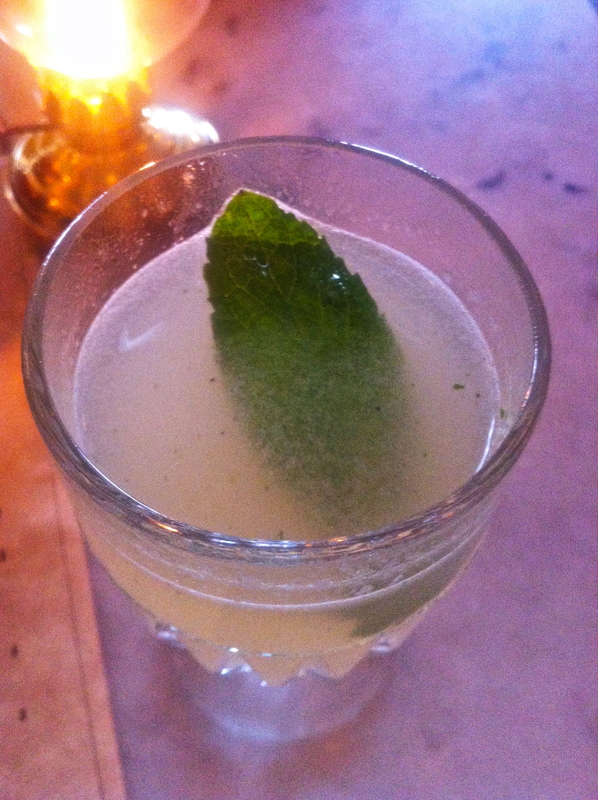 This is also not very gin forward for those wary of gin and its a nice drink to sip on a hot day. 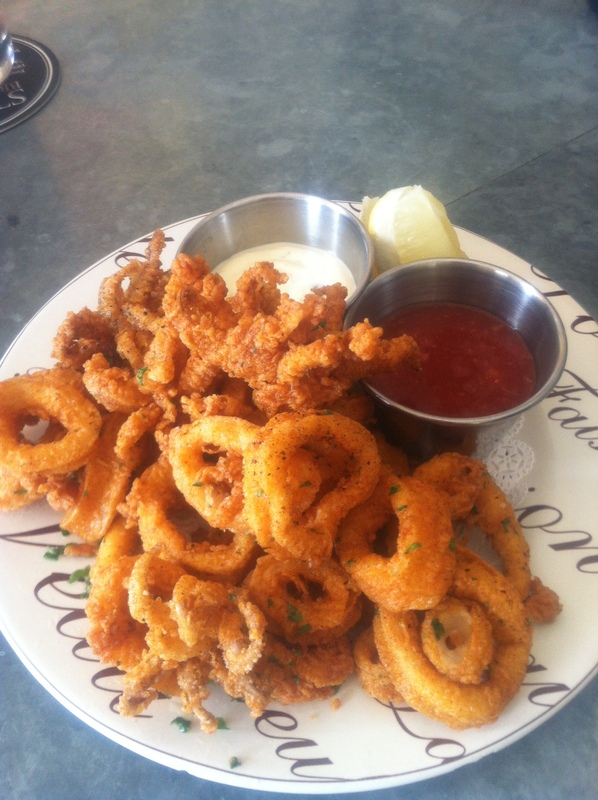 APPETIZERS: So the $6 dollar plates are small plates, we started off with the Crispy Calamari, as we noted previously, Jayne’s calamari is pretty great with a crispy golden crust that is unbeatable. It also comes with lemons, cocktail sauce and aioli for dipping. Jayne’s is also famous for their fish & chips. 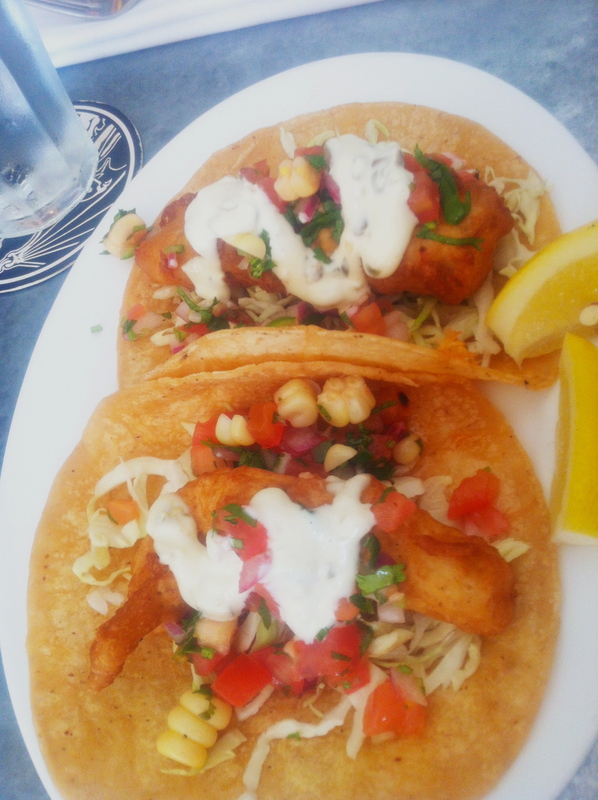 They use that same beer battered fish for their Sea Bass Fish Tacos so naturally we had to order that too. The tacos come with traditional toppings (shredded cabbage, corn, salsa, white sauce) and though nothing too crazy, they were good standard fish tacos. 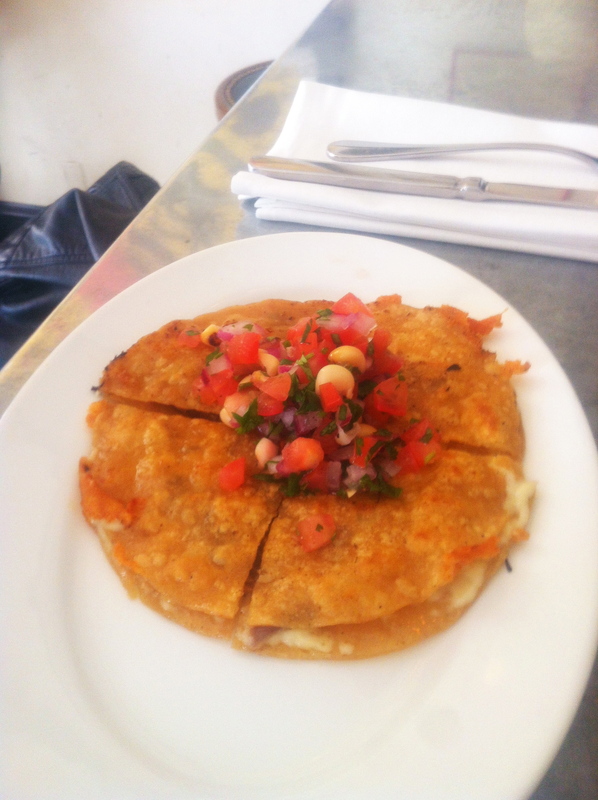 Another Mexican-leaning dish in this English pub type restaurant was a Pulled Pork Quesadilla. This was smaller than we were hoping it would be but still packed with flavor. Lastly they have the Baby Jayne’s Burger. Jayne’s burger is supposed to be great so I had to order the baby version during happy hour. This is definitely larger than a traditional slider but obviously smaller than a regular burger. It comes with a hefty portion of fries, these were good but not stellar but there were so many we couldn’t even finish them. 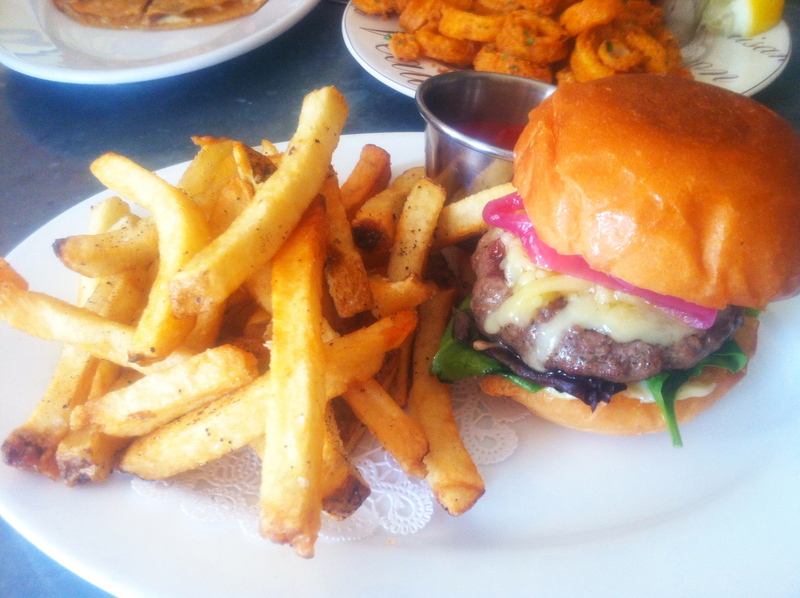 My burger came with pickled red onions, white cheddar, lettuce, tomato and mayo. There was also a side of ketchup. 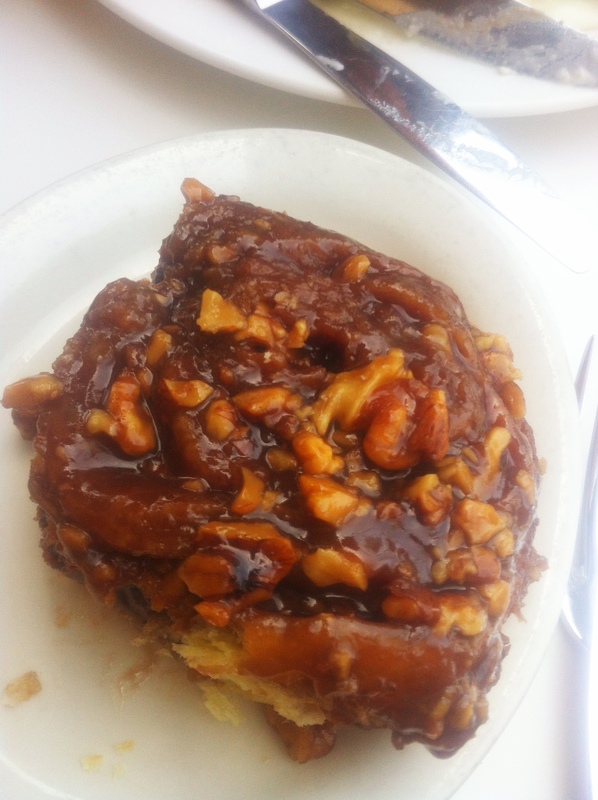 Great bun, good meat and solid toppings. This little guy was very tasty indeed, it would probably have been out of this world if the patty had been medium-rare instead of cooked all the way through, even cooked well-done it was still soo juicy. The medium-rare is a personal preference though and besides that there’s not many unkind things to say about this burger. I’m also sure its harder to cook a slider patty medium-rare since its thinner than a regular patty. DESSERT: Since everything else we ordered was a nice shade of beige or brown (happy hour menus rarely have very vegetable or non-fried options no?) 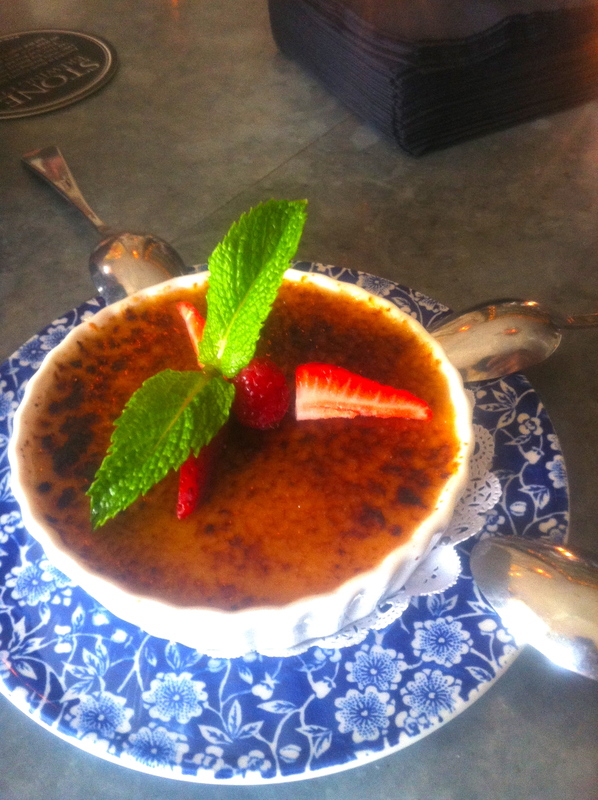 we thought we would continue the trend with the Caramel Crème Brûlée. This isn’t normally on their dessert menu but was a special that day. Overall we were sad happy hour could not be served in the back patio but we liked the food and the prices for Jayne’s happy hour. 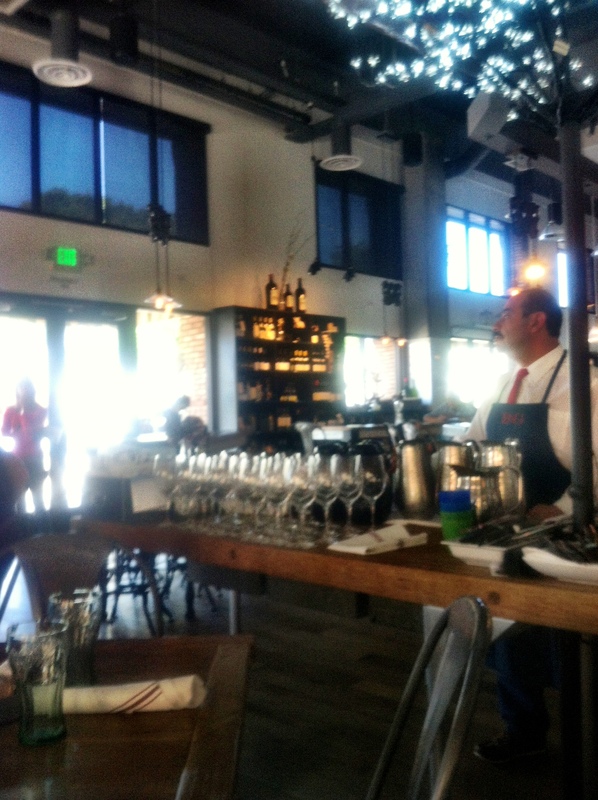 The service was excellent too, the bartender was super friendly and attentive. 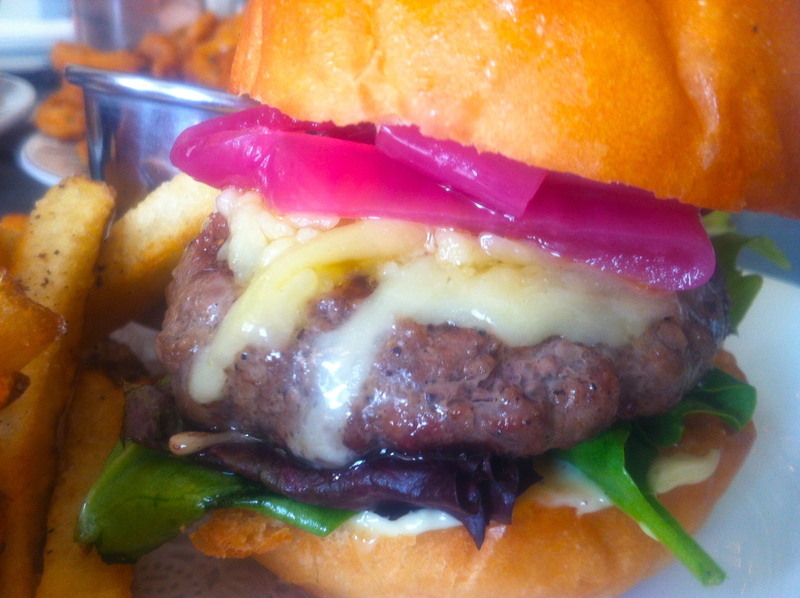 If you are planning to go to their happy hour our favorite was definitely the Baby Burger, ask for it medium-rare and you’ll definitely be a happy camper. Oh and if someone orders the White Bean Crostini with Grilled Peppers let us know how it is, I saw one sail by me and it looked quite tasty…. Puesto is a Chipotle style Mexican eatery in La Jolla, across the street-ish from Burger Lounge. We’ve heard really great things about Puesto and they’re doing so well they’re opening a second location at the Headquarters by Seaport Village (read more about The Headquarters here, there’s gonna be a Pizzeria Mozza!). Most importantly though, they were giving out free tacos for Cinco de Mayo. The tacos they were giving out were Gringo tacos, they were filled with a tasty ground beef mixture (beef picadillo). In terms of toppings they have an extensive selection including onions, cilantro, radishes, lettuce, limes and avocado (FOR FREE). The tacos are a little pricey (2 for $6.95 or 3 for $8.95) but I imagine the free avocado helps to mitigate this. For sauces they have green sauce, red sauce, a creamy habanero sauce and a chunky mango and tomato salsa.We literally got all the toppings and all the sauces. 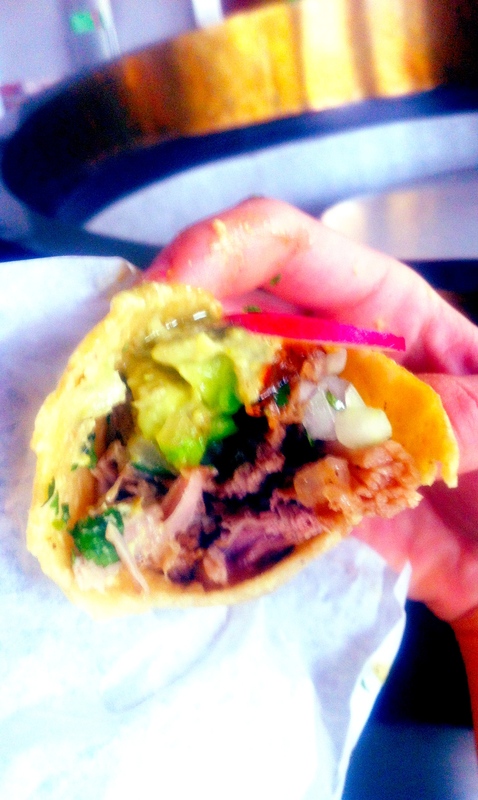 This resulted in a very tasty, albeit very messy taco. 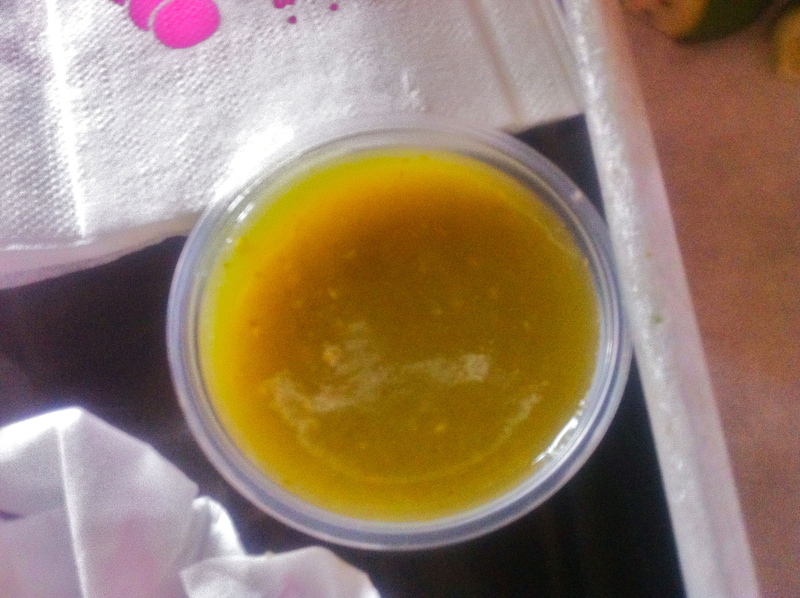 Also as a note the salsas are a little spicier than we expected but this was a welcome surprise. If you don’t like spicy I would say to tread carefully. 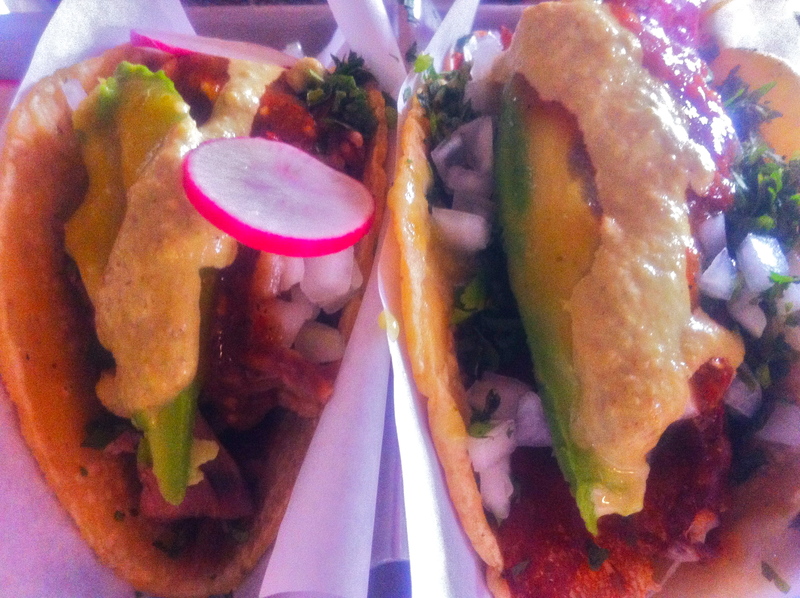 In terms of what comes standard with the taco they usually all have a meat and a cheese (except for the vegetarian one naturally). We ordered the Carne Asada, Chicken Al Pastor, and Carnitas. All the meats were pretty tasty although I wish they had a bit more of the crispy bits. 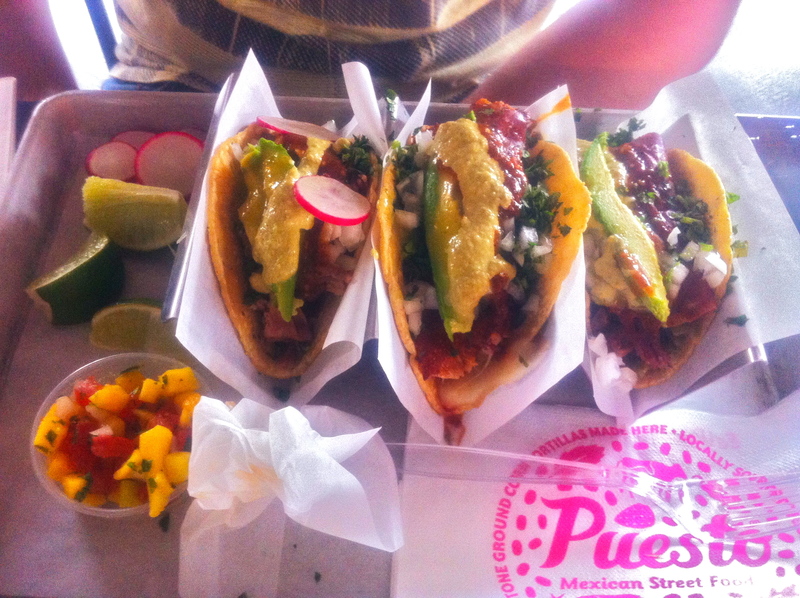 The carne asada and the chicken al pastor came with Puesto’s crispy cheese which we highly recommend. They basically griddle cheese until it forms a crispy brown crust on one side and line the taco with that. The carnitas came with cotija cheese. A lot of the tacos also come with tinga, a mixture of hibiscus and chipotle. Although this sounds delicious and came in the chicken al pastor we couldn’t really discern its taste under the copious amounts of toppings and salsa on the taco. The cactus in the carne asada was more noticeable and was a nice touch. We also ordered a side of half rice and half beans. At first we just ordered beans but the sides come in a rather large cup that left me wondering what on earth I was going to do with all those beans. 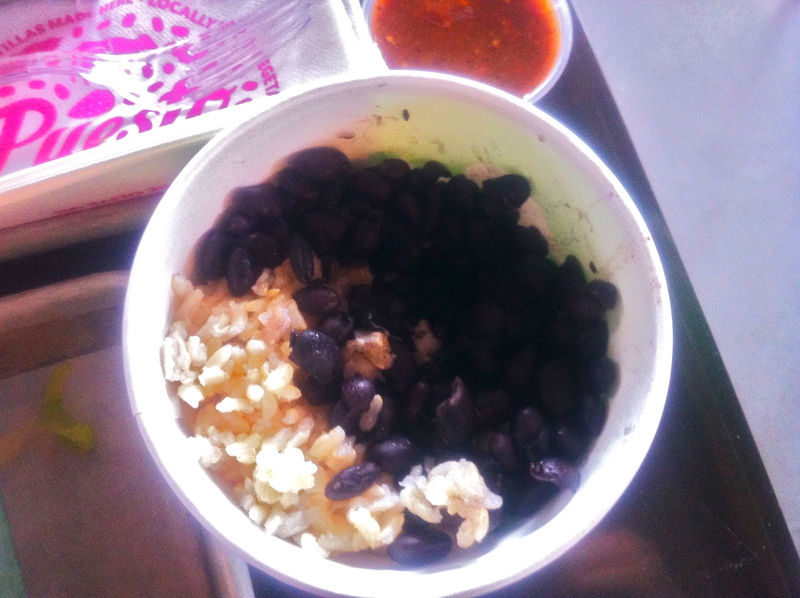 Luckily they do half and half sides so we did half brown rice and half beans. The beans are black beans, they are a little on the bland side and come with very little sauce, I imagine maybe this is because they are meant to be added to the tacos? The rice was also unremarkable, in the future I think we might skip these sides and try the spicy lime corn which sounded really good. One must order item there is the Frozen Horchata. This was amazing. 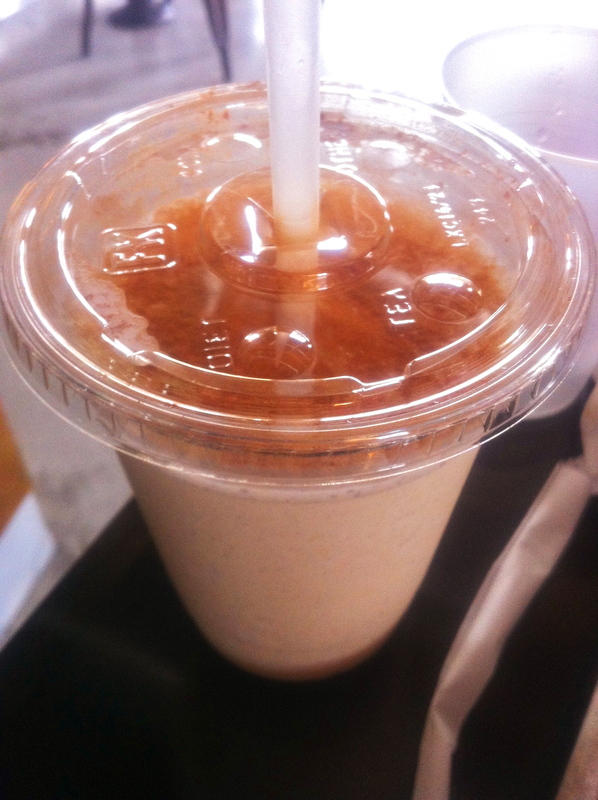 Like a super concentrated flavor horchata in slushie form. It’s a little sweet but I am not a fan of overly sweet things and still really enjoyed this. Lastly they also have paletas from Viva Pops. We got the Mexican Chocolate Paleta and although a bit small it was quite tasty. No picture because we ate it too fast. 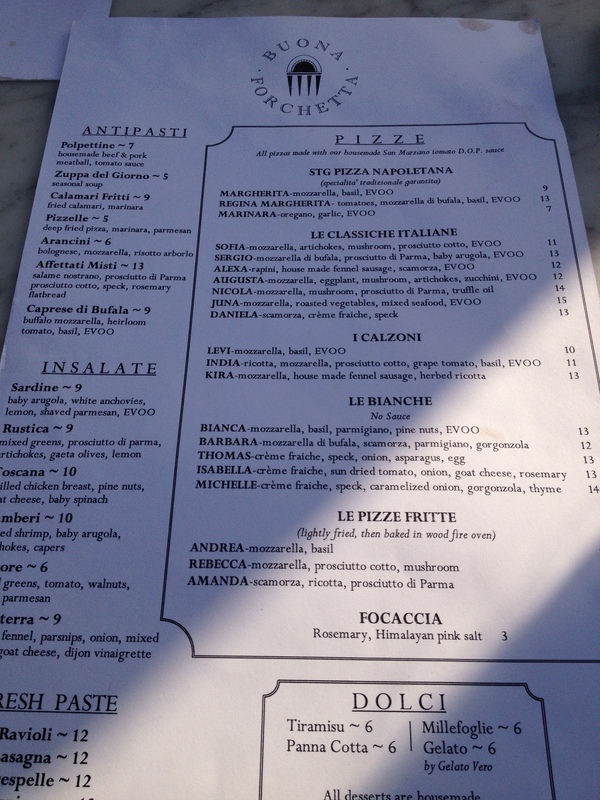 I’ve been hearing about Buona Forchetta for a while and was really excited to try this place with its gorgeous golden pizza oven (look at the website!). First driving into the Golden Hill / South Park area was great. I don’t frequent that area too often but its beautiful and I promised that I’ll start exploring it more. Its completely different from the other side of the Balboa Park along 6th Av., much less busy and so charming. But anyways, I digress. 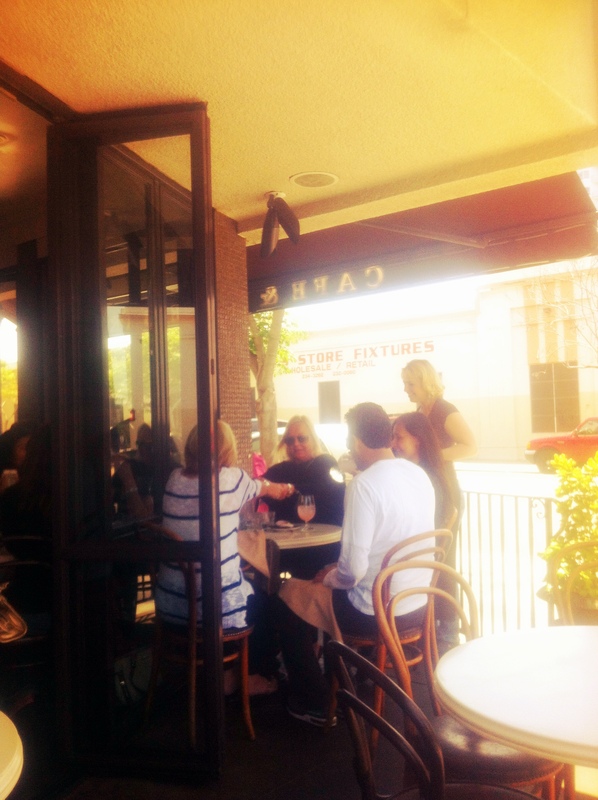 The place has a rather small inside but a nice patio with heaters. 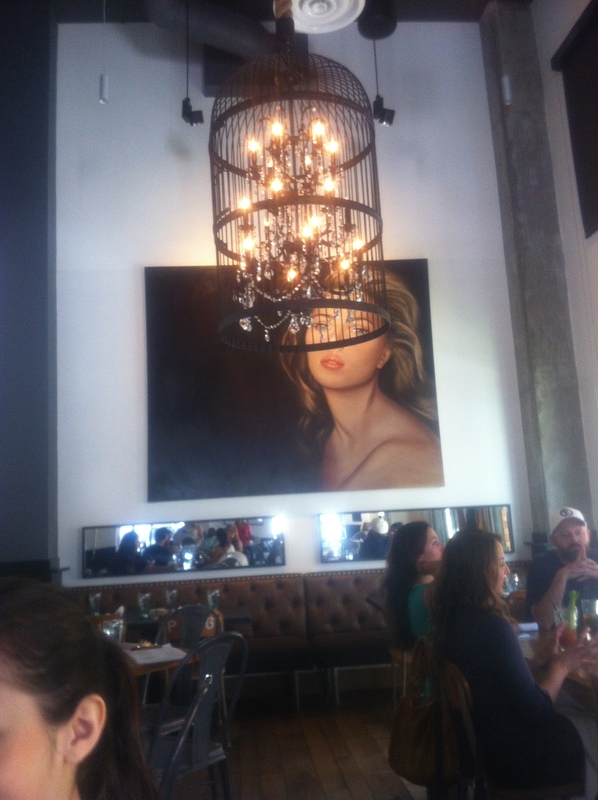 Loved the vibe of the place. The menu was fairly simple: appetizers, salads, pastas, pizzas (regular, white, fried), calzones and desserts. There was no happy hour but with glasses of sangria regularly priced at $4 and beer at $5 who needs happy hour anyways. 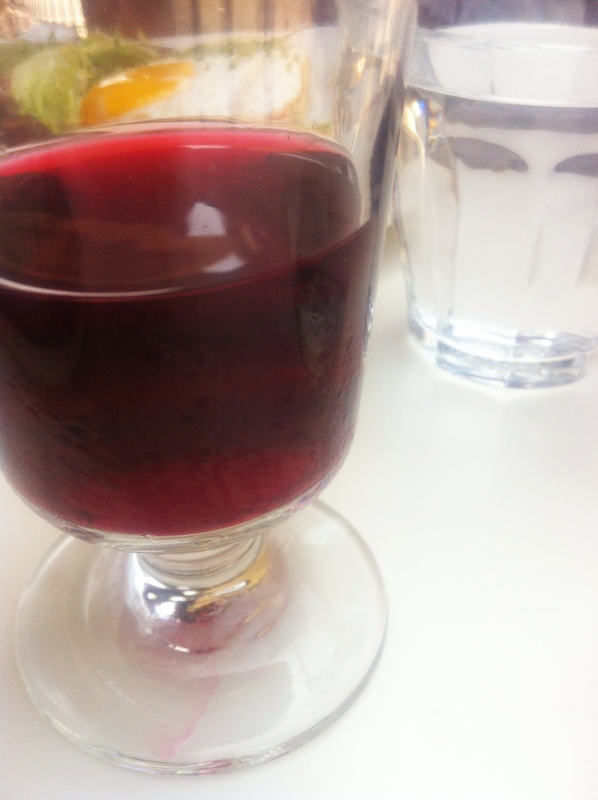 DRINKS: Even a better deal than the cups of sangria is a carafe of sangria. 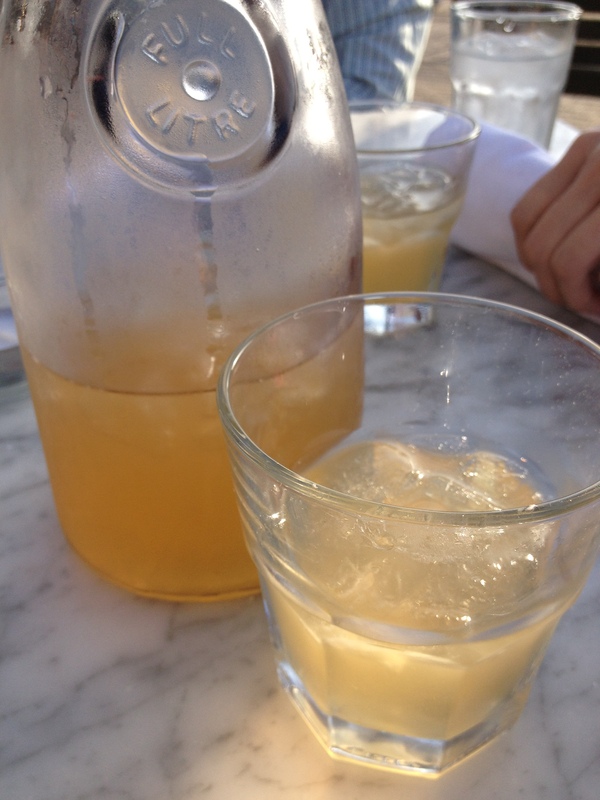 For $18 we got a carafe of fantastic white sangria. It was very crisp tasting although not very alcoholic. This was fine by me. APPETIZER: To start off we ordered the Pizzelle, fried up little rounds of puffy pizza dough with marinara sauce and parmesan. You get three of these little babies and they are quite tasty. 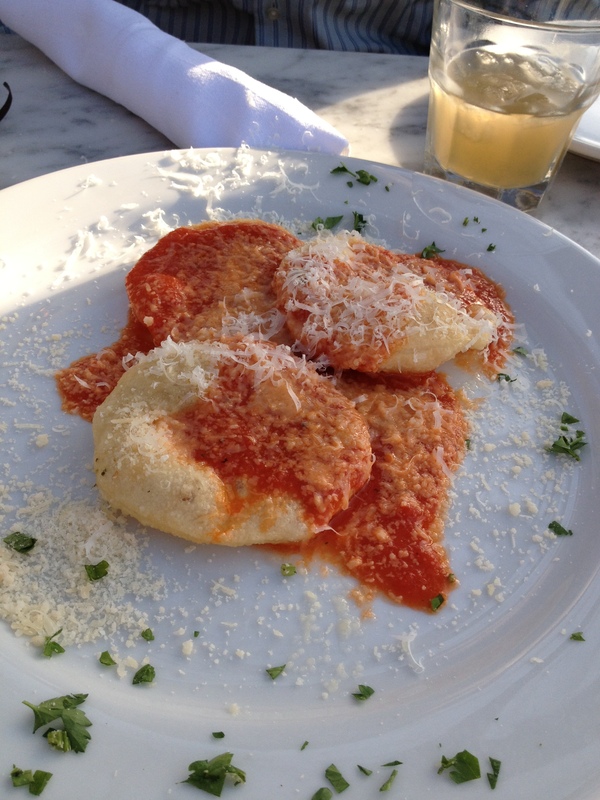 They’re very tomato-ey with all that sauce and the marinara is very fresh tasting. I liked these but eat them fast as they get soggy and cold sitting under all that sauce for a while. Also since I prefer marinara that tastes more like fresh tomatoes instead of stuff thats been cooking for days I really liked the sauce on the pizzelle and on all their pizzas. Probably because I felt guilty about my imminent consumption of vast amounts of cheese and dough I also ordered a salad, the Gamberi. 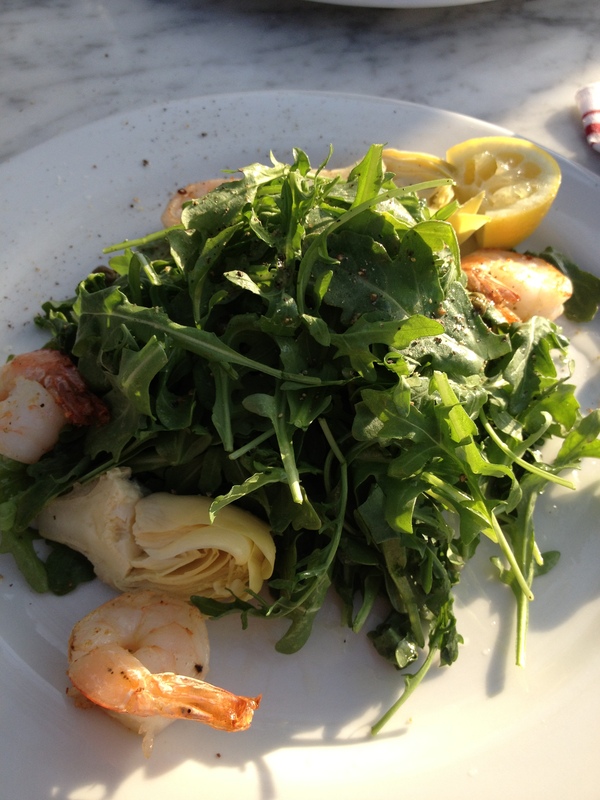 It had shrimp, arugula, capers, artichokes and a lemon-y dressing. 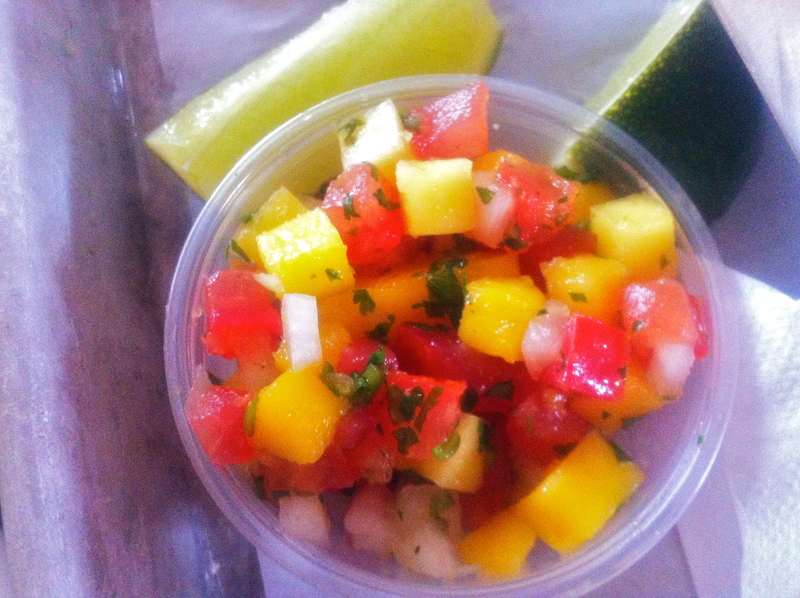 This salad is quite tart with the brininess from the capers and the lemon dressing, but it was tasty and refreshing. They also give you decent sized shrimp, I hate ordering something with shrimp and getting the tiny cheap crap shrimp. No such thing here. ENTREE: We got three pizzas to share. As a note the pizzas are personal sized and cut into 4 pieces, however we were 4 people and got three and it was more than enough. 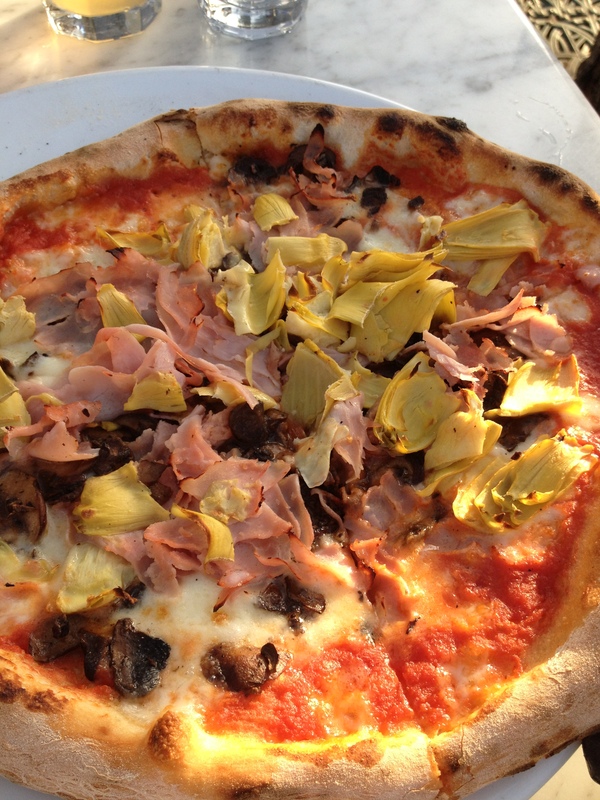 The first was the Sophia with mozzarella, artichokes, mushrooms and prosciutto cotto. Prosciutto cotto is cooked prosciutto. It was torn into small piece and it was crispy at the edges, tasting more like the best crispy ham ever instead of silky prosciutto. This was my personal favorite. There was just enough cheese + the mushrooms and artichokes worked wonderfully with the prosciutto cotto to feel like you were eating a fantastic hearty pizza. I have to commend them on their crust too; thin but still chewy with the perfect amount of char. That fancy oven is doing you good Buona Forchetta. We also got the Sergio. This was mozzarella di bufala (fresh mozzarella made from buffalo milk), fresh prosciutto and arugula. 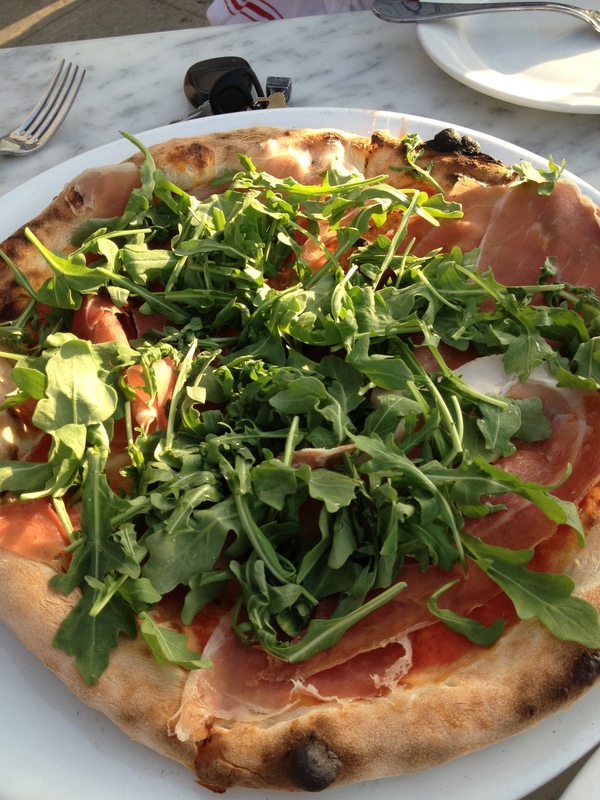 For this pizza the arugula and the prosciutto are added after the pizza leaves the oven so the prosciutto was still that silky soft texture and the arugula was crisp. This was also delicious, my only wish was that there was more mozzarella di bufala, I think that would have made this my favorite pizza. It definitely feels less hearty than the Sophia because its not all hot melty everythingness but its a perfect hot weather pizza since the fresh prosciutto and arugula balance out the hot crust and cheese. Our last pizza was a pizza bianche, or white pizza. 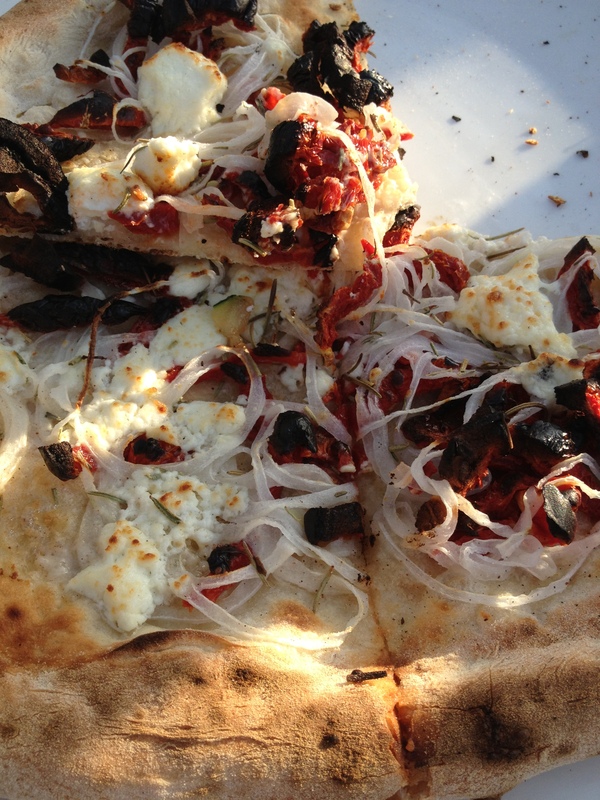 We ended up choosing the Isabella, with creme fraiche, sun dried tomatoes, goat cheese, onions and rosemary. Sadly this was my least favorite pizza but I normally prefer regular tomato based pizza over the white sauce versions. The sun dried tomatoes were a little too charred for me and the overall pizza felt dry, we all wished there had been more creme fraiche. They have very thinly sliced mostly raw red onions on the pizza too so if you love onions you will like this one.